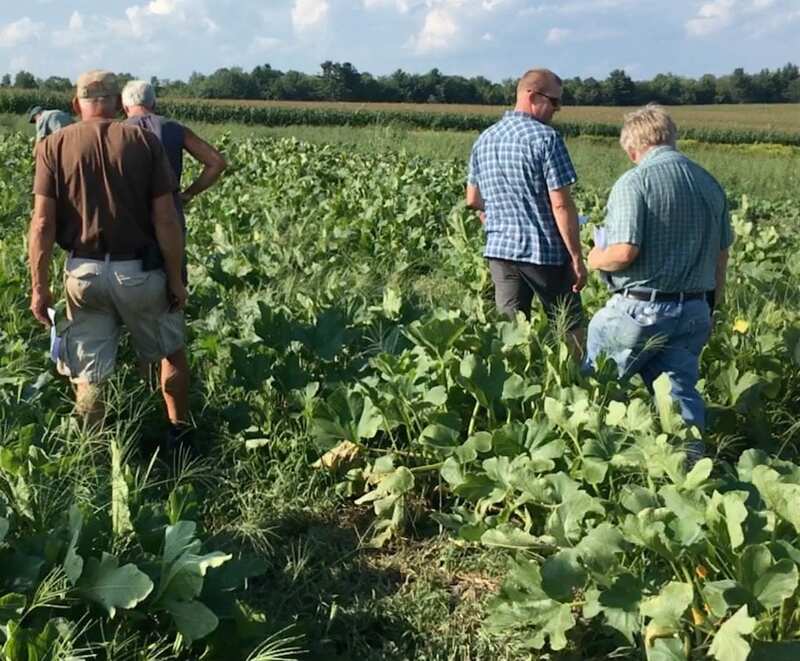 One of our goals for this project was to understand what biofungicides might add to a cucurbit powdery mildew management program. 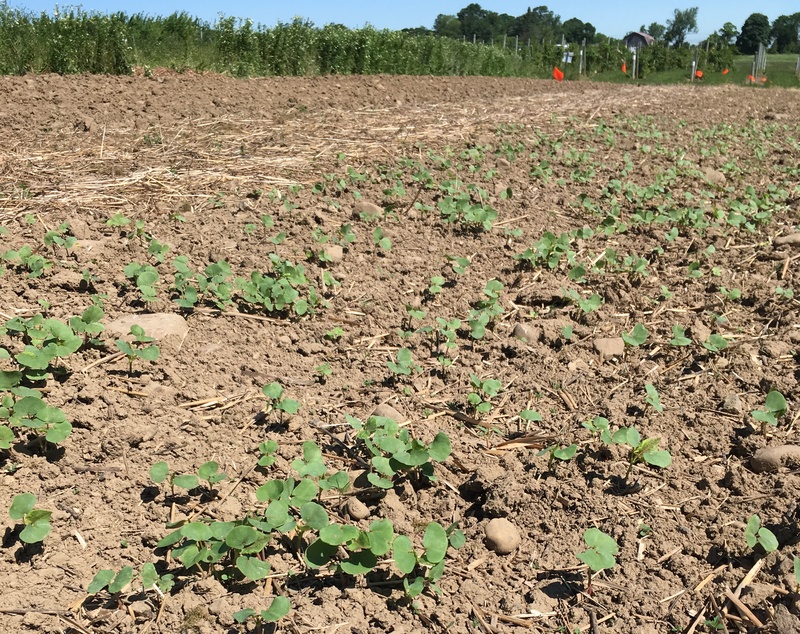 In 2018 we conducted field trials using biofungicides in cucurbit powdery mildew and snap bean white mold management programs. Hopefully you’ve read part 1 and part 2 of this biofungicide story. If not, now might be a good time. Part 1 will give you more details about the trial design. 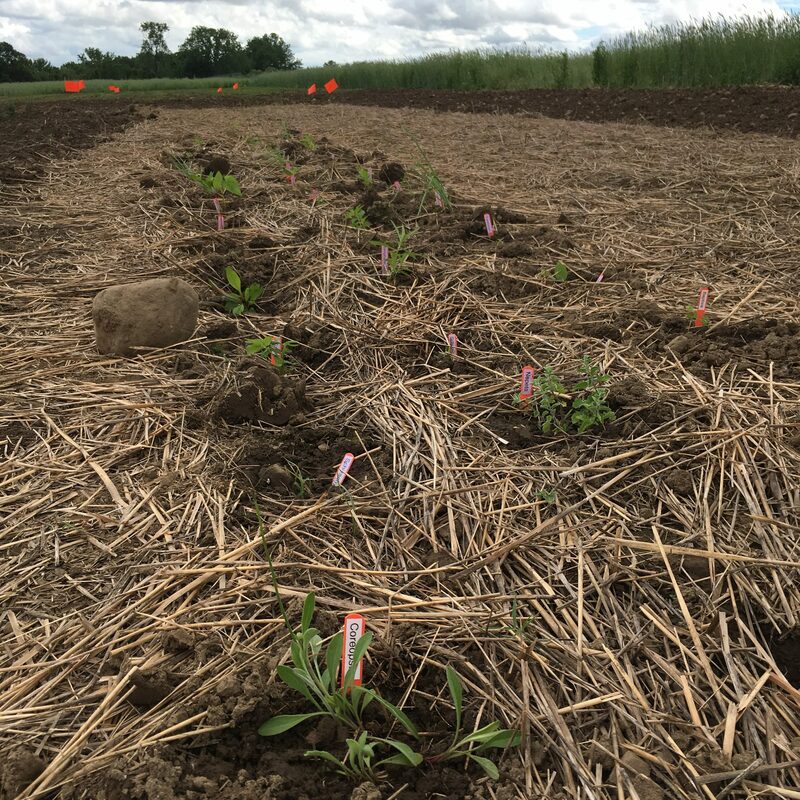 We wanted to know whether adding biofungicides would improve disease control, plant health, or yield. 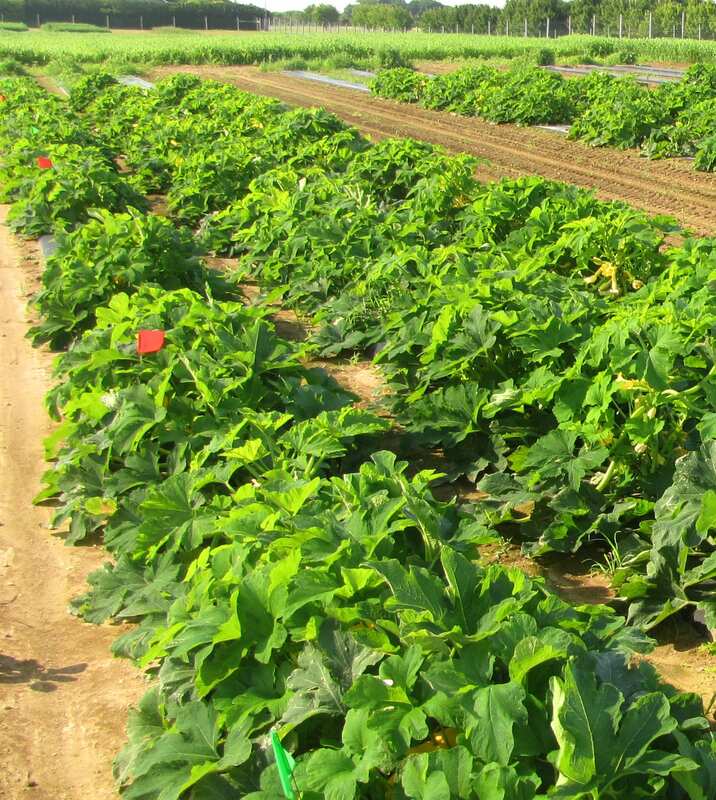 For cucurbit powdery mildew, we were adding one of three different biofungicides to a conventional chemical spray program. We also included a treatment that was all OMRI-listed (organic) products. 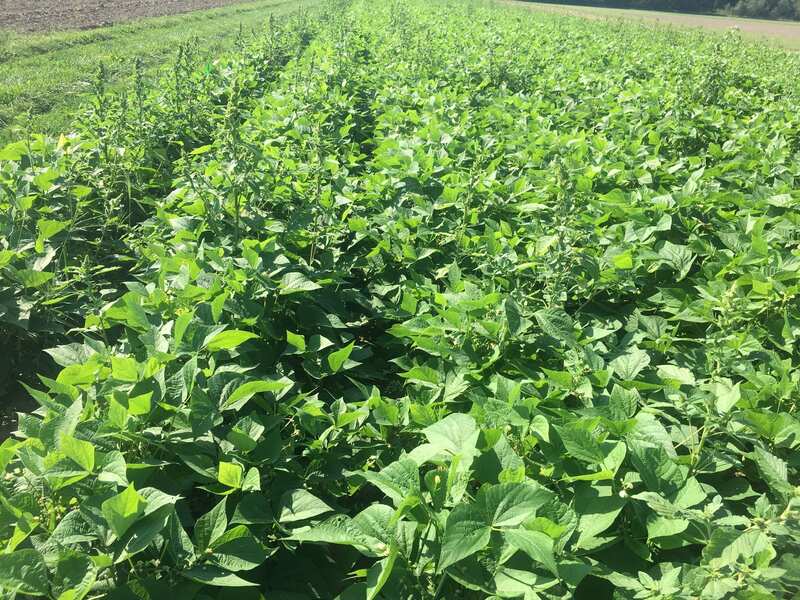 For white mold on snap beans, we were curious about using an in-season biofungicide (Double Nickel, Bacillus amyloliquefaciens strain D747) in combination with a pre-season biofungicide (Contans, Paraconiothyrium minitans strain CON/M/91-08). In 2018, our white mold treatments were just Double Nickel and Cueva (an OMRI-listed copper). In 2019, we’ll add the pre-season Contans treatment. Part 2 explains more about the modes of action of the five biofungicides we are looking at. The post also includes practical information about how to use these biofungicides to maximize their efficacy – compatibility with other products, best way to store them, when to apply them, etc. Now it’s time to talk about what we learned from this first year (of a two-year project). We don’t want to keep you in suspense, so here’s a quick summary of what we learned. 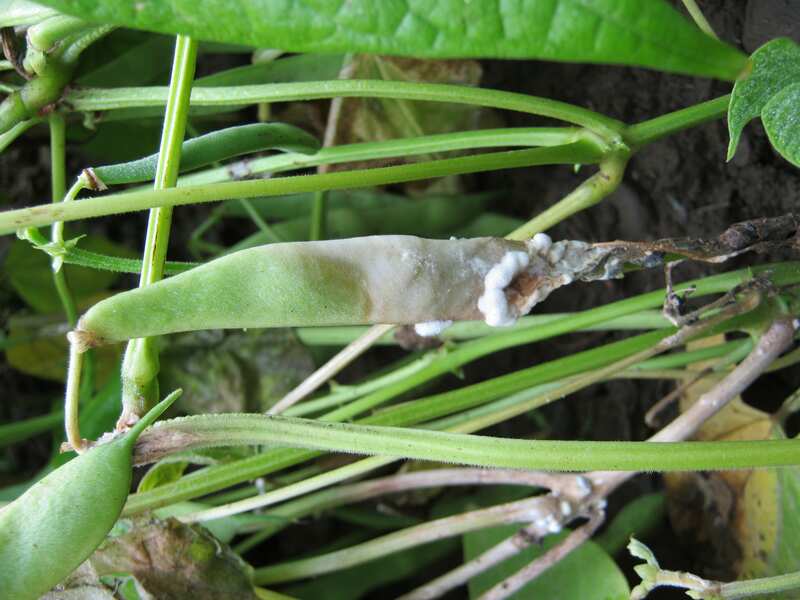 Fortunately for the eastern NY grower who graciously allowed us to run the trial on his farm (but unfortunately for us), the snap bean field had very little white mold in 2018. Even the plots that were not sprayed with Double Nickel or Cueva had almost no disease. So we weren’t surprised when there were no differences in disease, plant health, or yield among the white mold treatments. Results from Sarah Pethybridge’s efficacy trials with OMRI-approved products for white mold are available online. 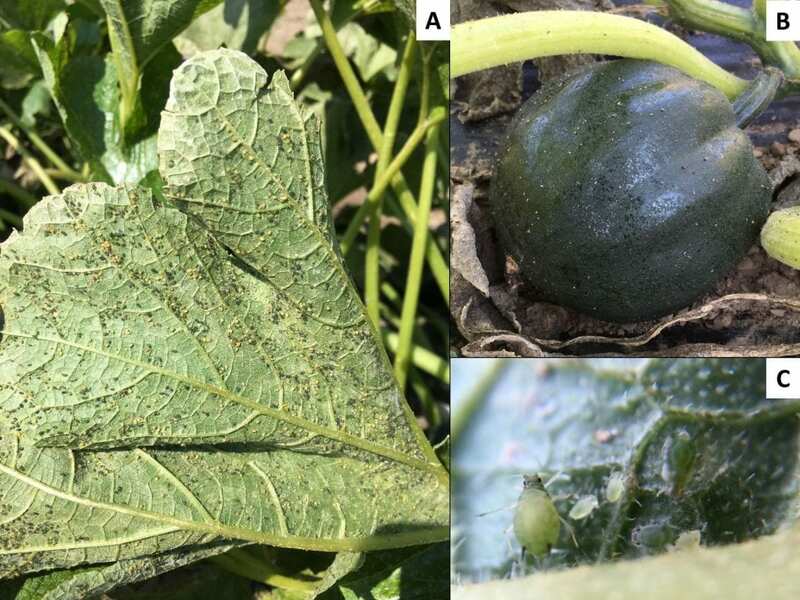 Cucurbit powdery mildew was a bit more severe than white mold (low pressure in eastern NY, moderate pressure in western NY and on Long Island), but we were not able to detect statistically significant benefits from adding biofungicides to a conventional spray program. Disease severity, plant health (as measured by NDVI), yield, and fruit quality (Brix) were the same whether you used a conventional spray program, or a conventional spray program plus a biofungicide. We didn’t measure significant differences in yield among any of the treatments at any of the three sites. Severity of powdery mildew on the upper sides of the leaves in the Western NY trial. Here, disease severity is quantified using the area under the disease progress curve (AUDPC). This number summarizes disease severity from multiple dates, and the larger the number, the worse the disease. If two treatments share the same letter, the average disease in those treatments is not significantly different. The error bars give you an idea of how much variability there was in each treatment. NDVI (normalized difference vegetation index) values did not detect cucurbit powdery mildew early. (Since there was so little white mold, we couldn’t test NDVI for early detection.) There was some inconsistent correlation between NDVI readings and disease, yield, and Brix in winter squash. In WNY we used both a handheld GreenSeeker and a gator-mounted Crop Circle to measure NDVI. Both devices had similar results. Based on this first year of testing with these two devices, NDVI measurements were not useful as an early indicator of cucurbit powdery mildew. In addition, NDVI measurements did not detect subtle differences in plant health among treatments. At only one of our three sites (Long Island) were there any significant differences in NDVI among treatments. This was only on the last two rating dates in the season, when powdery mildew was visibly more severe in the non-treated control than the conventional fungicide treatments. Normalized difference vegetation index (NDVI) measured on winter squash in the Long Island trial on three dates at the end of the season. NDVI values closer to 1 indicate more healthy, green foliage. 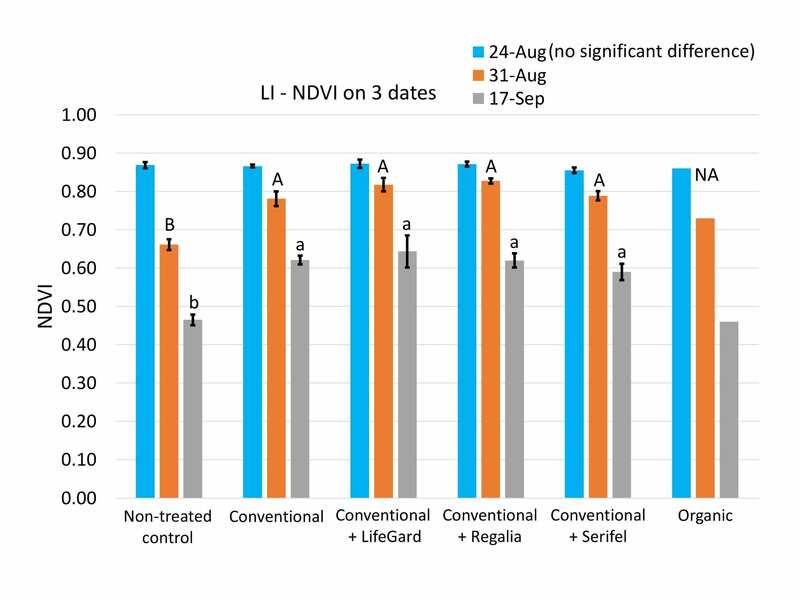 If two treatments have the same a letter on the same date, the average NDVI readings on that date were not different between the two treatments. Data from August 31 are labeled with uppercase, while data from September 17 are labeled with lowercase letters. There were no differences among any treatments on August 24. The error bars give you an idea of how much variability there was in each treatment. 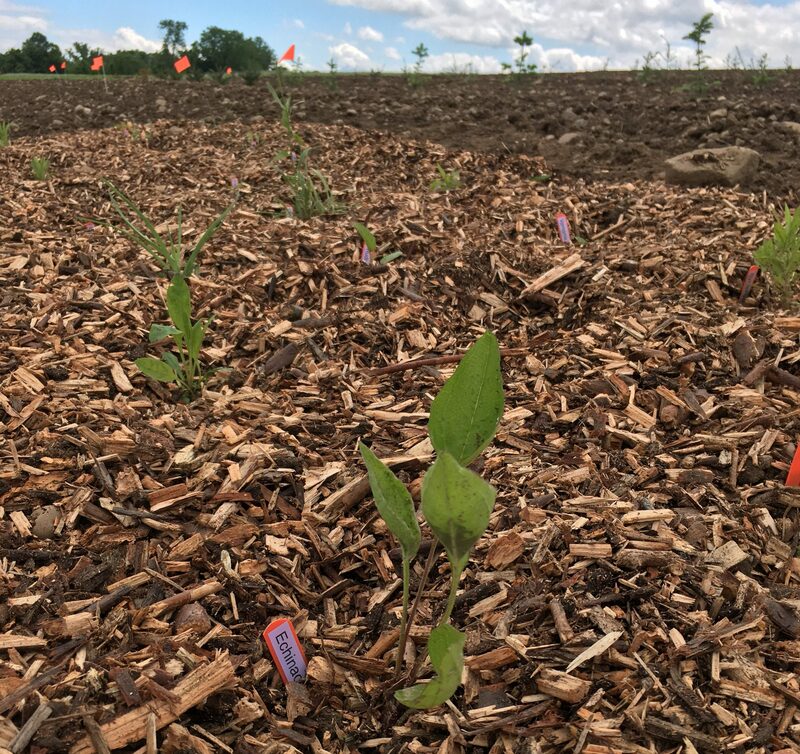 We couldn’t do statistics on the organic treatment because too many plants were killed by Phytophthora blight in the plots that received this treatment. The non-treated control (received no powdery mildew fungicide) was often not significantly different from the conventional fungicide control (our best management program). 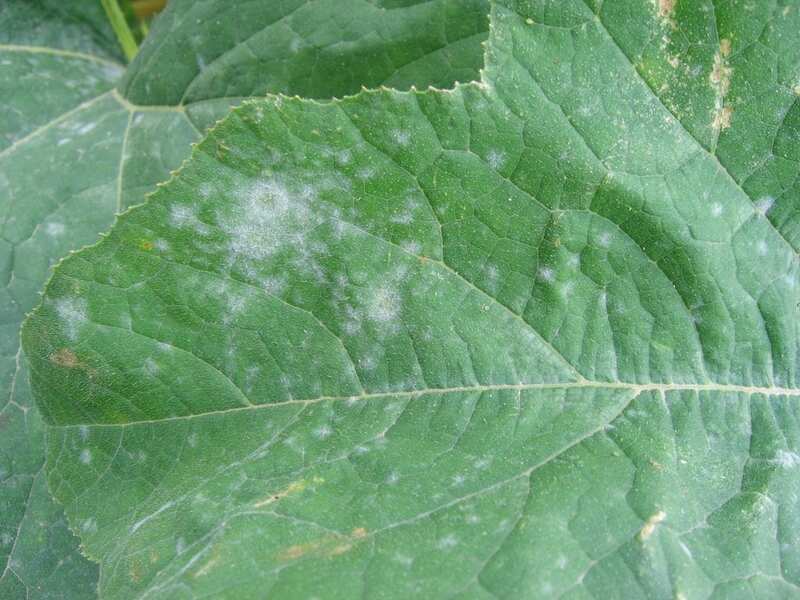 We know that controlling powdery mildew on cucurbits is important, so if we don’t detect a significant difference between the non-treated control and the treatment that should have provided the best control, it is then hard to draw further conclusions from the data. 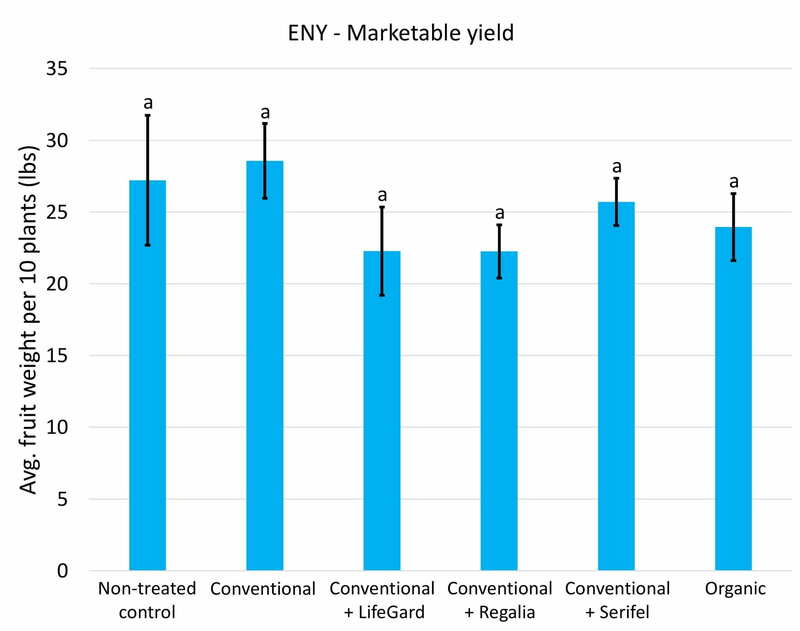 We didn’t detect statistically significant differences in marketable yield among any of the treatments in any of the trials. Here are the data from eastern NY. Notice that all six bars are labeled with the letter “a”. As with previous graphs, the error bars give you an idea of how much variability there was across the different plots in each treatment. When disease pressure is low (as it was in Eastern NY), we would expect not to see many differences between treatments. Similarly, if the conventional fungicide program provided excellent disease control (as it did on Long Island), it would be hard to detect an improvement in control from adding a biofungicide. Another challenge we dealt with in the Long Island trial was Phytophthora blight. By the end of the season, we had lost two of the four plots receiving the organic treatment to this disease. This limited our ability to statistically analyze the biofungicide data. 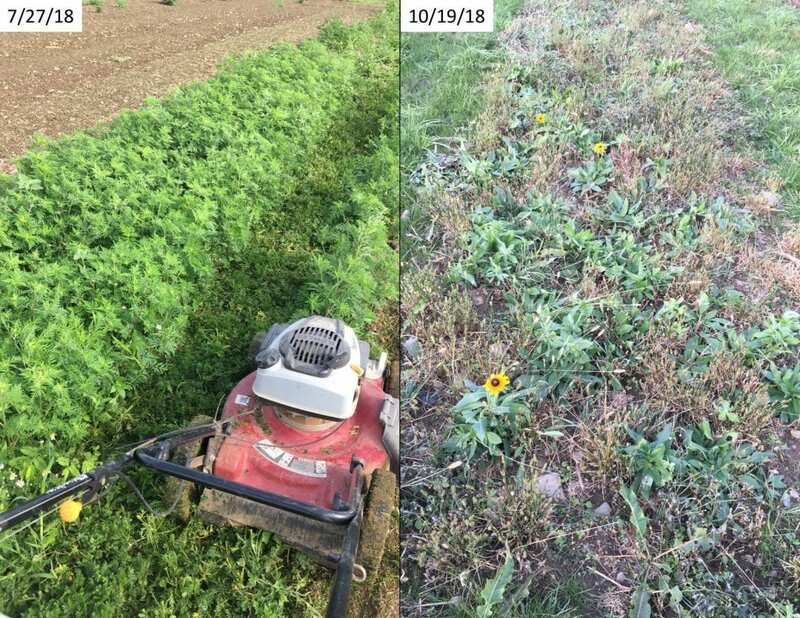 On Long Island, the organic spray program initially performed well – as seen on August 31 – comparable to the conventional treatments. But by the final assessment on September 17, the organic program was no longer as effective. This was not surprising since it was 10 days after the last application. Suffoil-X was the final organic product applied, and it has little residual activity. 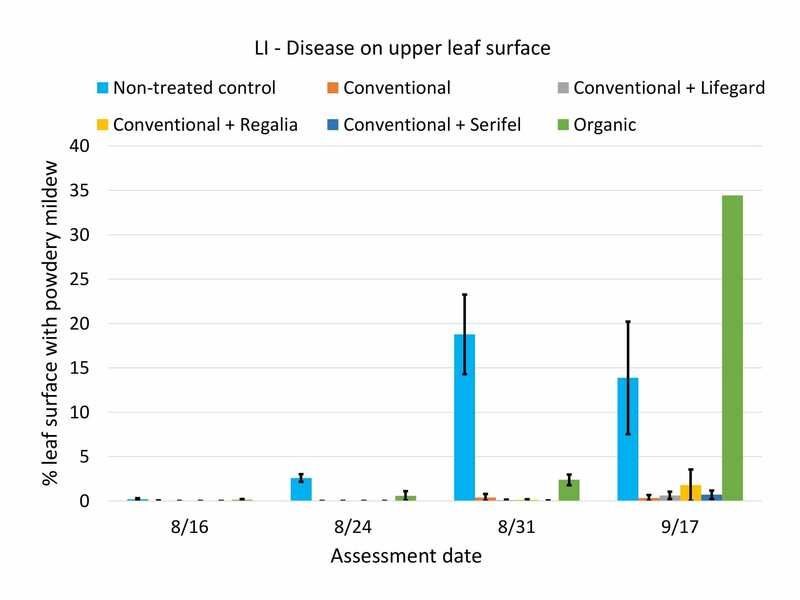 Average severity of powdery mildew on the upper surface of leaves on the last four assessment dates in the 2018 Long Island trial. All of the treatments (except the non-treated control) suppressed powdery mildew well through August 31. 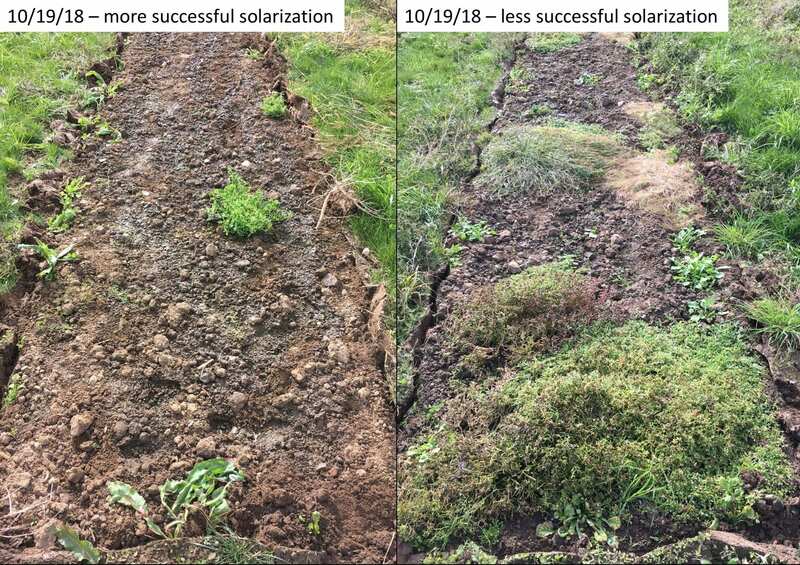 Control in the organic treatment had declined by September 17, but this was 10 days after the last spray was applied. In WNY, we had an epic aphid outbreak. An entomologist colleague identified them as probably melon aphids, and also that 2018 was generally a bad year for aphids. It’s also possible that while trying to control cucumber beetles earlier in the season, we killed some aphid natural enemies, contributing to an aphid outbreak later in the season. I know cucumber beetles are tough, but if you can manage them without decimating your local natural enemies, you’ll be doing yourself a favor! The severe aphid outbreak in the western NY trial may have made it more difficult to detect differences among treatments. In late August, some of the leaves were covered with aphids (A), and many fruit were covered with honeydew (B). Getting a close look at the aphids is essential for correct identification (C). We deliberately used a very intensive spray program, starting our biofungicide applications early, and continuing to apply them as we added conventional fungicides later in the season. This was an expensive powdery mildew management program. 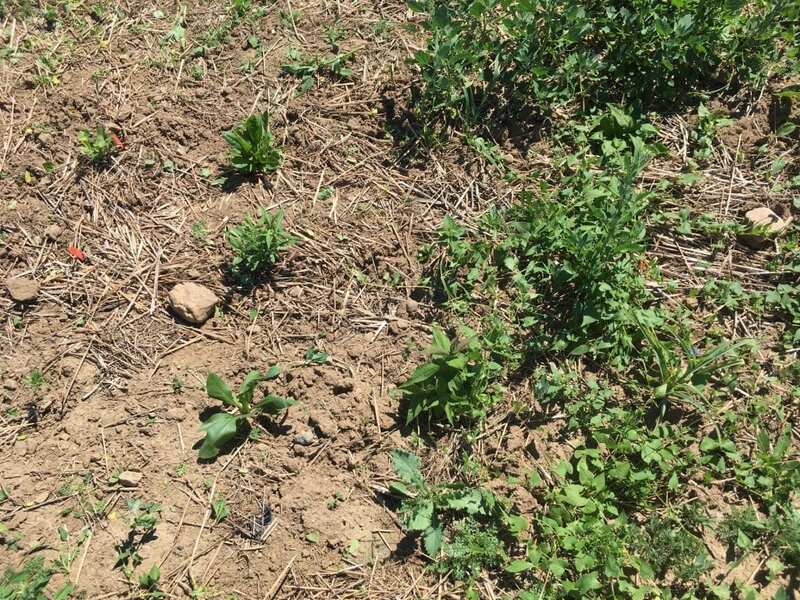 But, in this first year of the project, we didn’t want to be left wondering if a lack of differences was due to underapplication of the biofungicides. If you want to see more of the data we collected from the cucurbit powdery mildew trial, you can find it in the Proceedings from the 2019 Empire State Producers Expo. First, this is only the first year of our project and one year of data. It’s a start, but we’ll hopefully learn more in a second year. Since we didn’t measure a significant improvement in yield, we didn’t see evidence that adding biofungicides to a full chemical spray program for powdery mildew justified the cost. The relative costs of the treatments we used are listed in the table below, and the approximate per acre costs of each product are in the Proceedings from the 2019 Empire State Producers Expo. Replacing a chemical spray or two with a biofungicide could be a more economical option. That’s something we’re planning to look at in 2019. Based on results from this year, we can’t yet recommend that you run out and buy a handheld NDVI sensor for early detection of cucurbit powdery mildew. We’ll collect NDVI data again in 2019, and let you know what we learn. 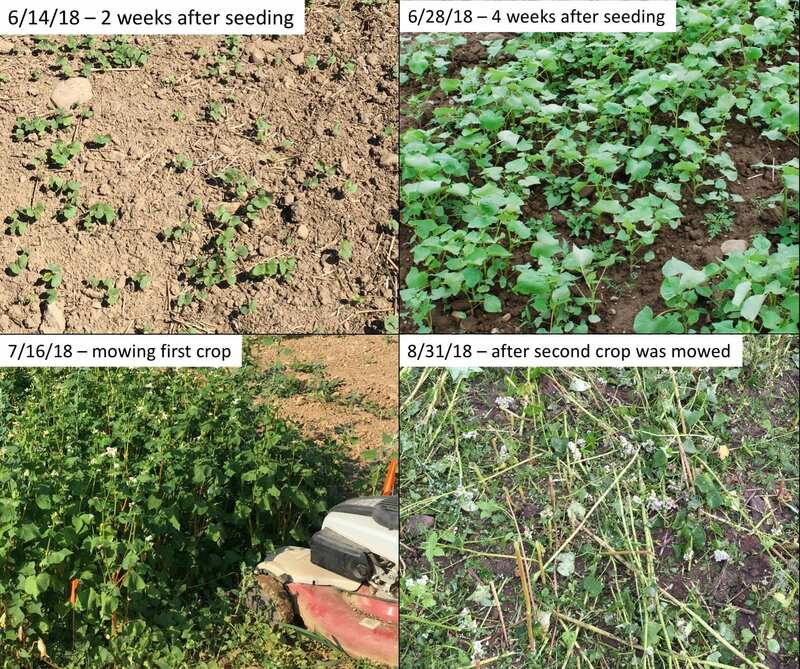 Although our results from the field trials were somewhat inconclusive in this first year, we’re hopeful that the information we’ve compiled about how these biofungicides work and how to use them will be useful. If you’re thinking of using Contans, Double Nickel, LifeGard, Regalia, or Serifel in 2019, first take a look at these fact sheets related to our white mold and powdery mildew trials. And if you have used biofungicides, we’d be interested in hearing about it; click here to send an e-mail. This post was written by Amara Dunn (NYS IPM), Elizabeth Buck (Cornell Vegetable Program), Meg McGrath and Sarah Pethybridge (both Plant Pathology & Plant-Microbe Biology, School of Integrative Plant Science, Cornell University), Crystal Stewart (Eastern NY Commercial Horticulture Program), and Darcy Telenko (Department of Botany & Plant Pathology, Purdue University). Thank you to the New York Farm Viability Institute for funding. Bioinsecticides include microorganisms and other naturally-derived compounds that control insect pests. 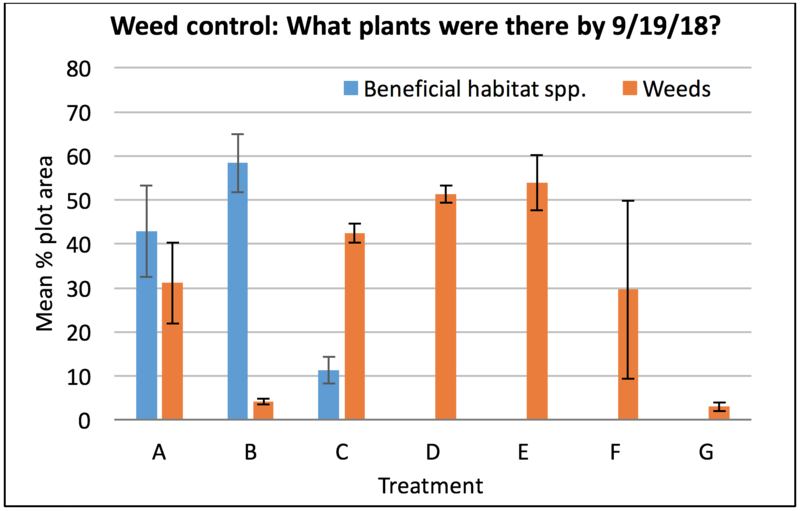 My post from last February described modes of action for biopesticides that target plant diseases…as well as the difference between a biopesticide and a biostimulant. January’s post described the modes of action of five biofungicides in an ongoing vegetable trial. But there are plenty of insect and mite pests out there, too. You can attract or release predatory or parasitic insects and mites or beneficial nematodes to deal with these arthropod (insect and mite) pests. But you can also use bioinsecticides that control insects and mites. The active ingredients include microorganisms (bacteria, fungi, viruses), plant extracts, or other naturally-occurring substances. Want to know how they work? Keep reading. The examples included in the following descriptions are reported either on the bioinsecticide labels or in promotional materials produced by the manufacturers. And these are just examples, not meant to be an exhaustive list of bioinsecticides with each mode of action. Some bioinsecticides contain living spores of a fungus. These spores need to land on the insect. Then they germinate (like a seed), invade and grow throughout the body of the insect, and eventually kill it. If the humidity is high enough, the fungus may even produce more spores on the body of the dead insect. Some bioinsecticides need to directly contact the body of the insect or mite in order to kill it. Bioinsecticides that contain living fungi work this way. The tiny fungal spores land on the insect or mite pest, germinate (like a seed), and infect the body of the pest. The fungus grows throughout the pest’s body, eventually killing it. If the relative humidity is high enough, you might even see insects that look like they are covered with powder or fuzz (but this is not necessary for the pest to die). This powdery or fuzzy stuff growing on the pest is the fungus producing more spores. Bioinsecticides that contain the fungal species Beauveria bassiana (e.g., BotaniGard, Mycotrol), Metarhizium anisopliae or brunneum (e.g., Met52), or Isaria fumosorosea (NoFly) are examples of fungal bioinsecticides with contact activity. Bioinsecticides that contain spinosad (including Entrust, SpinTor, and others) work because the active ingredient affects the nervous and muscular systems of the insect or mite, paralyzing and eventually killing it. It can kill the pest either through contact, or through ingestion (more on that in a moment). The bioinsecticide Venerate contains dead Burkholderia bacteria (strain A396) and compounds produced while growing the bacteria. One mode of action of Venerate is that it contains enzymes that degrade the exoskeleton (outer shell) of insects and mites on contact. Some bioinsecticides need to be eaten (ingested) in order to kill. Pesticides that contain the bacteria Bacillus thuringiensis (often called Bt for short) as the active ingredient are a good example. Proteins that were made by Bt while the bioinsecticide was being manufactured are eaten by insects and destroy their digestive systems. 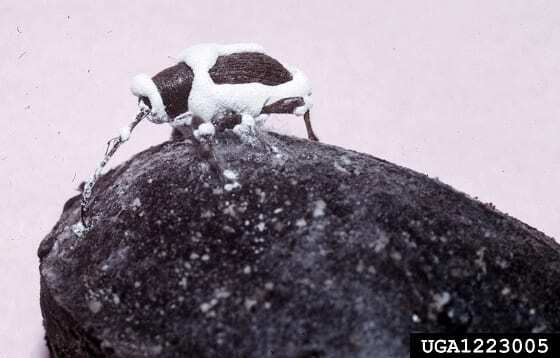 Several different subspecies of Bt are available as bioinsecticides, and the subspecies determines which insect pest it will be effective against. There are many bioinsecticides registered in NY that contain Bt as an active ingredient. Check NYSPAD for labels, and make sure you choose the right pesticide for the pest and setting where you need control. Bt products do not work on mites, aphids, or whiteflies. Some bioinsecticides (blue diamonds in this diagram) will only kill pests if they are eaten first. Pesticides that contain Bacillus thuringiensis (Bt) bacteria or insect viruses are examples of this mode of action. Insect viruses are another example of a bioinsecticide active ingredient that kills through ingestion. For example, Gemstar contains parts of a virus that infects corn earworms and tobacco budworms. Once these caterpillars eat the Gemstar, the virus replicates inside the pest, eventually killing it. Some bioinsecticides repel insects from the plants you want to protect. However, this mode of action may only work on certain pest species, or certain life stages of the pest. Read and follow the label. Bioinsecticides containing azadirachtin or neem oil, and Grandevo are reported to have repellent activity for some pests. Grandevo contains dead bacteria (Chromobacterium substugae strain PrAA4-1) and compounds produced by the bacteria while they were alive and growing. 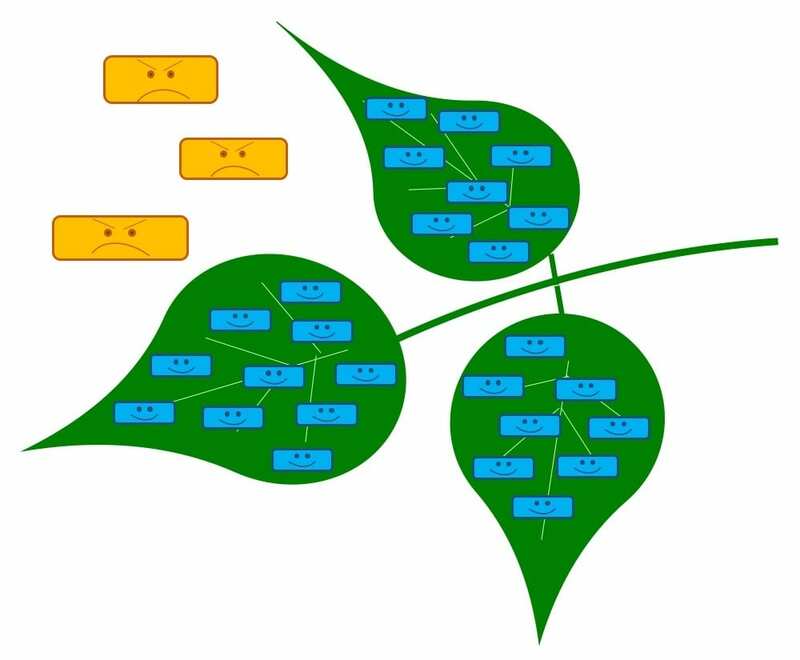 Some bioinsecticides (blue diamonds and happy microbes in this diagram) protect plants because they repel insect and mite pests. This protects treated plants from pest damage. If you want insect and mite pests dead as soon as possible, I understand the sentiment. But in many cases stopping the pests from eating your plants would be just as good, right? Some bioinsecticides cause pests to lose their appetite days before they actually die. Like bioinsecticides that kill pests outright, some bioinsecticides that inhibit feeding require ingestion, while others work on contact. And these bioinsecticides may work this way for only certain pest species of certain ages. Read and follow those labels! Bioinsecticides containing Bt require ingestion and some can stop pest feeding before actually killing the pest. The same goes for Gemstar (corn earworm virus). This is another mode of action of azadirachtin products against some pests. 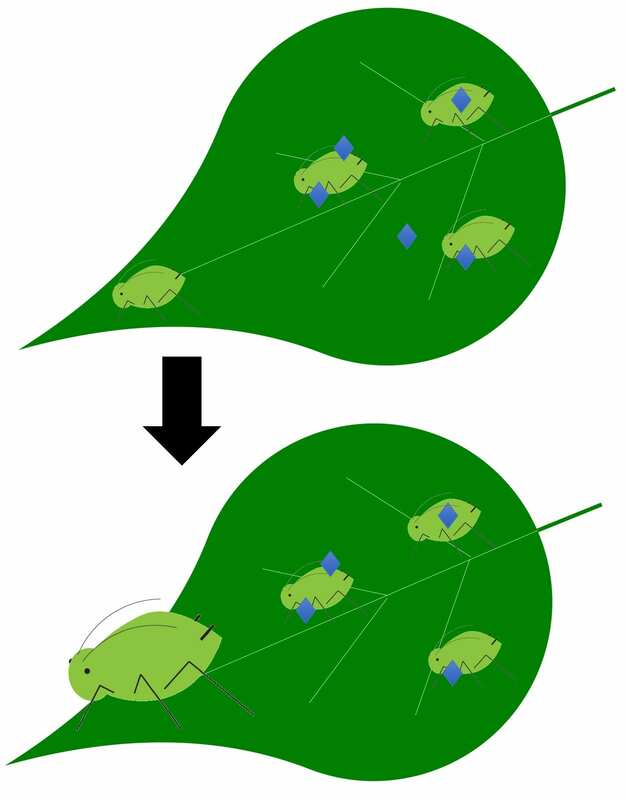 Some bioinsecticides (blue diamonds and happy microbes in this diagram) cause insect and mite pests to lose their appetites. Depending on the bioinsecticide, it either needs to contact the pest or be eaten by it. Many insects and mites need to molt (shed their skin as they go from one life stage to another). Bioinsecticides that interfere with molting prevent pests from completing their life cycle. Like feeding inhibitors, these bioinsecticides won’t directly kill the pests you have, but they can prevent them from multiplying. This is another mode of action (again, for certain pests at certain stages of development) listed for azadirachtin products and Venerate (Burkholderia spp. strain A396). 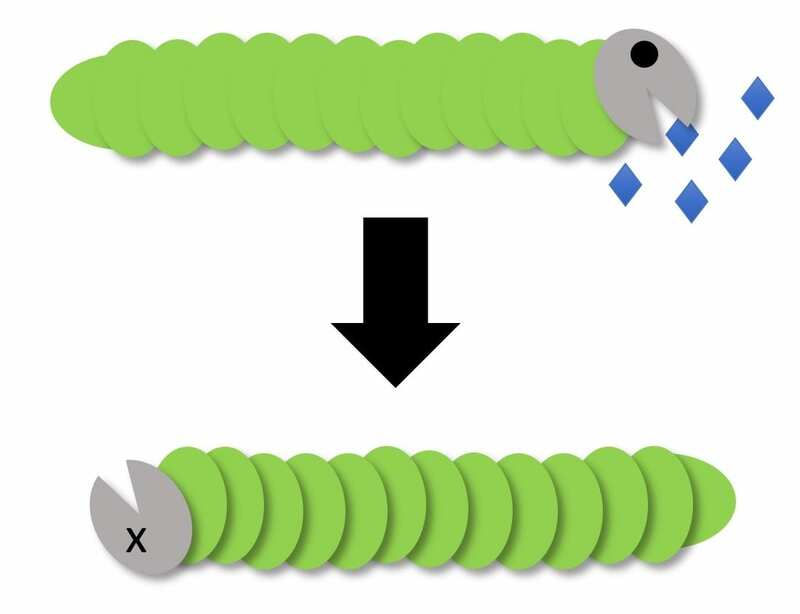 Some bioinsecticides (blue diamonds in this diagram) don’t kill insects and mites outright, but they can prevent them from molting and growing into the next life stage. Pests that can’t move on to the next life stage will eventually die without completing their life cycle. There are two main types of bioinsecticides that prevent or slow insect reproduction. Pheromones are compounds that confuse insects that are looking for mates. If males and females can’t find each other, there won’t be a next generation of the pest. 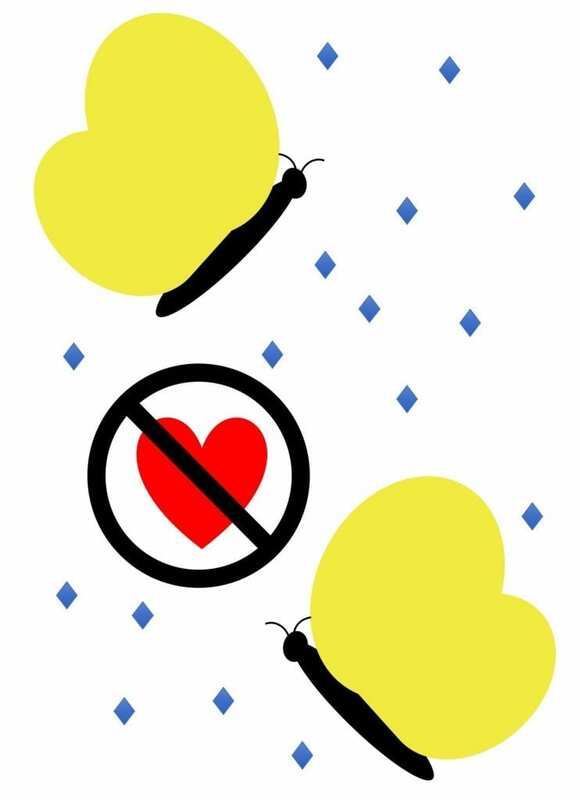 Pheromones can be especially useful when the adults that are looking for mates don’t feed (e.g., moths). Isomate and Checkmate are two examples of pheromones available for certain fruit pests. Other bioinsecticides actually reduce the number of offspring produced by a pest. This is one of the modes of action of Grandevo (Chromobacterium substugae strain PRAA4-1) against certain pests. Pheromones (represented here by blue diamonds) are a type of bioinsecticide that confuses insects looking for a mate. As a result, males and females can’t find each other, don’t mate, and don’t lay eggs. Do you mean besides the fact that you are a curious person and you want to know how biopesticides work? Knowing the mode of action for the pesticide you use (among other things) allows you to maximize its efficacy. Does the bioinsecticide need to contact the pest, or be eaten by it? This determines where, when, and how you apply it. Do you want to use a bioinsecticide that inhibits growth of the pest? Make sure you use it when pests are young. (Sidenote: Like all biopesticides, bioinsecticides generally work best on smaller populations of younger pests.) Is the first generation of the pest the one that causes the most damage? Don’t rely on a bioinsecticide that inhibits reproduction. Although if the pest overwinters in your field and doesn’t migrate in, maybe you could reduce the population for the next season. Now is a great time of year to consider the insect and mite pests you are likely to encounter this season, then learn which bioinsecticides include these pests (and your crop and setting) on the label. Always read and follow the label of any pesticide (bio or not). How do you know whether these bioinsecticides are likely to work in NY on the pests listed on the label? That’s a topic for another post. In the meantime, the Organic Production Guides for fruit and vegetables from NYS IPM are a great place to start. When available, they report efficacy of OMRI-listed insecticides (including some bioinsecticides). Your local extension staff are another great resource. 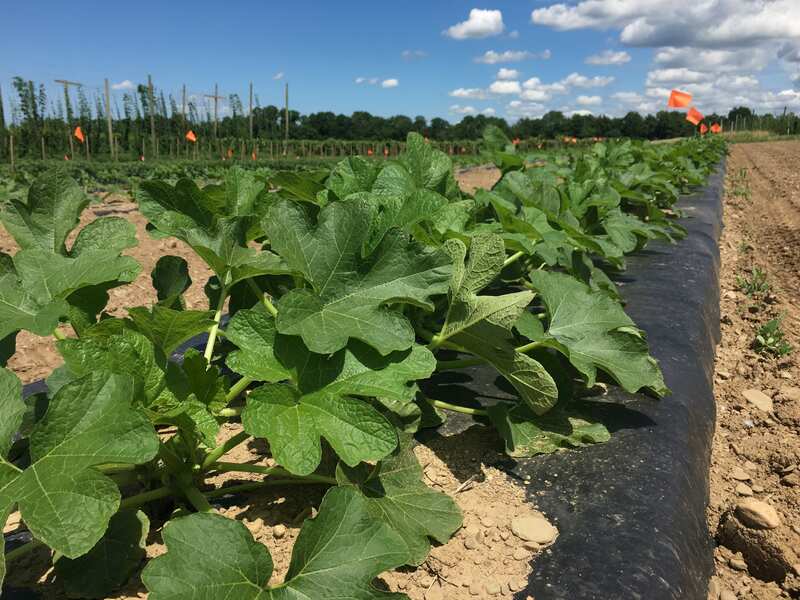 Winter squash in our cucurbit powdery mildew biopesticide trial conducted in western NY, eastern NY, and on Long Island in 2018. We are also testing biopesticides for white mold. Photo credit: Meg McGrath. Can I tank mix them with other pesticides or with fertilizers? Do I need to use these products differently than I would use a chemical pesticide? Today’s post will try to answer those questions. Modes of action – How do they work? 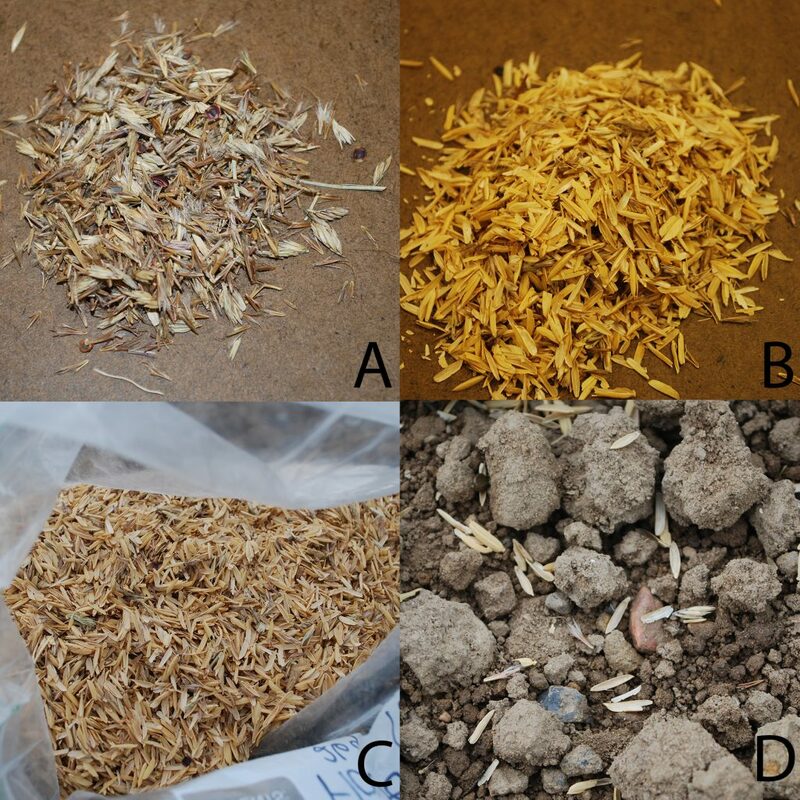 As you may recall from February’s post, biopesticides work in different ways, and the five biofungicides we’re studying cover the range of these modes of action. Biopesticides protect plants from diseases in different ways. I like to divide them up into the five modes of action (MOAs) in this table. Like many biopesticides, some of the products we are testing have more than one MOA. Click on the table to enlarge it. 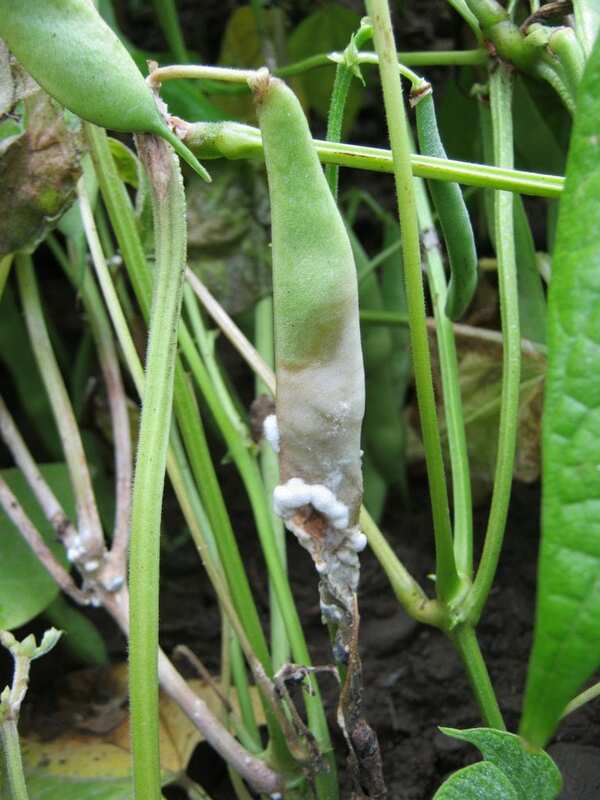 The fungus active ingredient of Contans (Paraconiothyrium minitans strain CON/M/91-08; formerly called Coniothyrium minitans) “eats” (parasitizes and degrades) the tough sclerotia of the fungus, Sclerotinia sclerotiorum that causes white mold. Sclerotia survive in the soil from year to year. However, for this strategy to be effective, the fungal spores within Contans have to first make contact with the sclerotia. The time between colonization and degradation of sclerotia is about 90 days. The active ingredients in Serifel and Double Nickel are bacteria – same species but different strains. They both produce compounds that are harmful to plant pathogens (antimicrobial). According to the manufacturer, most of the foliar efficacy of Double Nickel is due to the antimicrobial compounds already present in the container. But the manufacturer notes that some of the efficacy also comes from the live bacteria that are responsible for this product’s other modes of action, especially the induction of plant resistance (more on this later). The strain of bacteria in Serifel has been formulated so that it contains only living bacteria (no antimicrobial compounds). The manufacturer’s goal is for the bacteria to produce antimicrobial products unique to the specific environmental conditions after application. 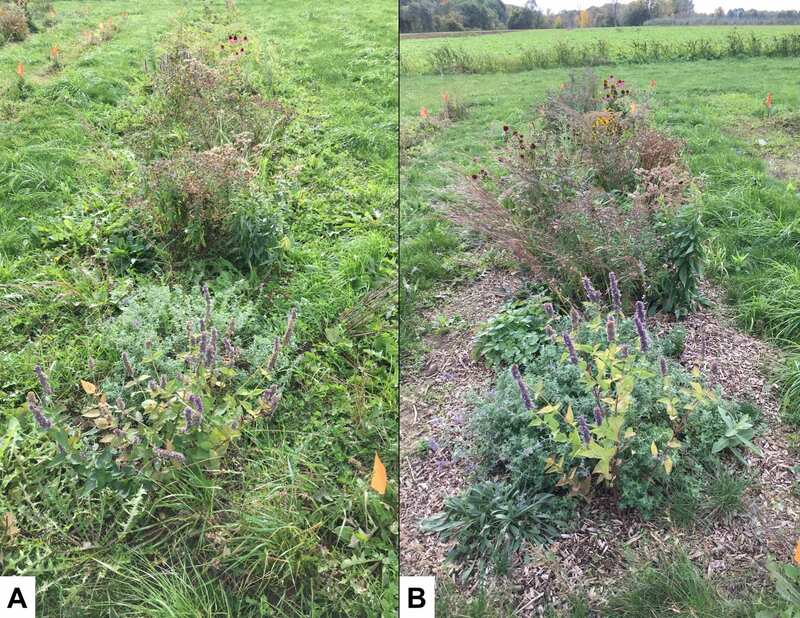 Double Nickel and Serifel are examples of different strategies for using antimicrobial-producing bacteria to fight plant diseases. Our goal is to explain how the products work; not tell you which strategy is better. Some biopesticides contain microbes that grow on the plant. These beneficial microbes use up space and nutrients so there is no room for the pathogen, excluding it. The bacteria in Double Nickel and Serifel also can protect plants from disease by growing over (colonizing) the plant so that there is no space or nutrients available for pathogens. How important this mode of action is to the efficacy of Double Nickel depends on the setting and time of year (according to the manufacturer). 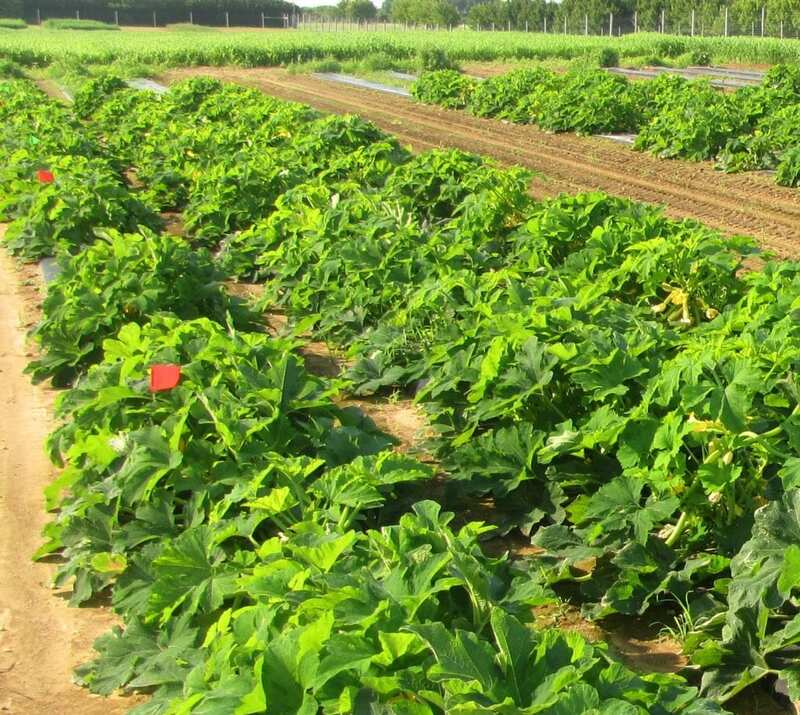 Cucurbit leaves exposed to sun, heat, and dry air are not great places for bacteria to grow, and pathogen exclusion is not likely to be very important in protecting cucurbit leaves from powdery mildew. The antimicrobial MOA is more important here. Apple blossoms being protected from fire blight in the early spring could be a different story. 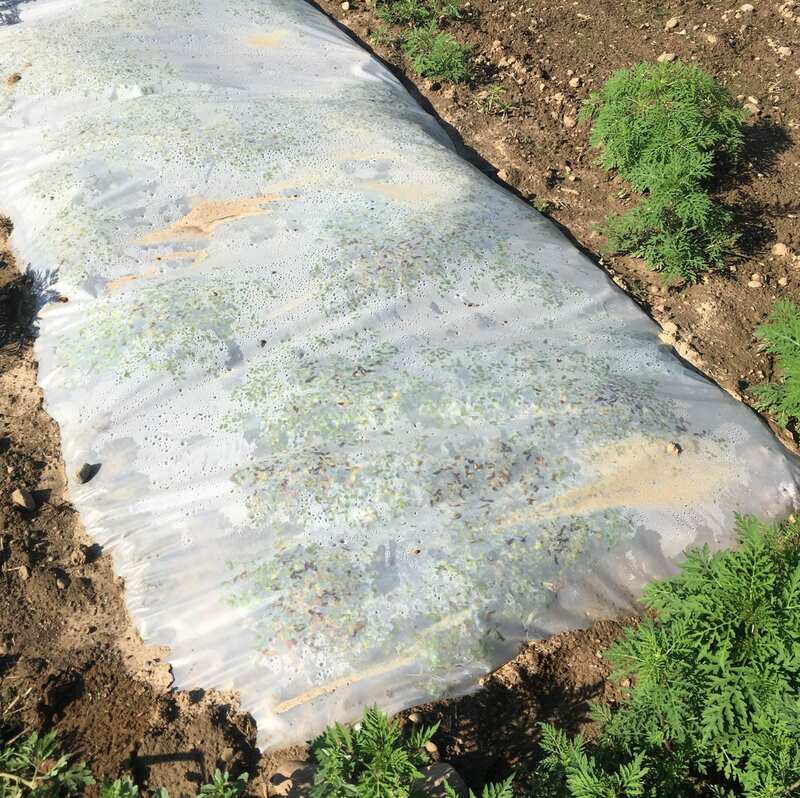 The bacteria in Serifel tolerate a wide range of temperatures in the field, but the manufacturer recommends applying this product with a silicon surfactant to help the bacteria spread across the plant surface better. Plants have mechanisms to defend themselves. Some pathogens succeed in causing disease when they avoid triggering these defenses, or when they infect the plant before it has a chance to activate these defenses. Some biofungicides work by triggering plants to “turn on” their defense mechanisms. 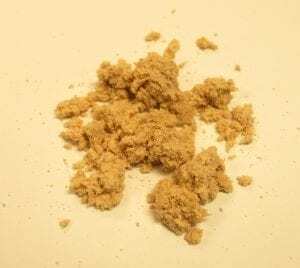 This is called “inducing plant resistance.” It is the sole mode of action of the bacteria in LifeGard, and one of the modes of action for the active ingredients in Double Nickel, Regalia, and Serifel. The last biofungicide being studied in this trial has a plant extract as an active ingredient, instead of a microorganism. Regalia works by both inducing plant resistance, and also promoting plant growth and stress tolerance. Some of the other products in this trial also share these MOAs. According to the label, some crops treated with Regalia produce more chlorophyll or contain more soluble protein. This final MOA (promotion of plant growth and stress tolerance) is also sometimes shared with “biostimulants”. But remember that “biostimulant” is not currently a term regulated by the EPA. This may be changing in the future, so stay tuned. Biostimulants enhance plant health and quality. They are not registered as pesticides, and must not be applied for the purpose of controlling disease. Make sure you read and follow the label of any product you apply. Best practices – How do I use them? We’ll get to some product-specific details in a minute, but first some notes about best uses for all five of these products. They need to be used preventatively. For biofungicides to eat pathogens, exclude them from plants, induce plant resistance, or improve plant growth and stress tolerance, they need to beat the pathogen to the plant. It takes time for the plant to fully activate its defenses, even if “flipping the switch” to turn those defenses on happens quickly. The same applies to promoting plant growth and stress tolerance. And if you want the beneficial microorganism to already be growing where the pathogen might land, of course you need to apply the product before the pathogen is present. Microbes that produce antimicrobial compounds also work best if they are applied when disease levels are low. Use IPM. These biofungicides (and most, if not all, biofungicides) were designed to be used with other pest management strategies like good cultural practices, host resistance, and other pesticides. For example, they can be included in a conventional spray program to manage pesticide resistance. Mix what you need, when you need it. Don’t mix biofungicides and then leave them in the spray tank overnight. Some products may need to be used even more promptly. Check the label. Store carefully. Generally, away from direct sunlight and high heat. Follow the storage instructions on the label. They have short intervals, but still require PPE. One of the benefits of biofungicides is short pre-harvest intervals (PHIs) and re-entry intervals (REIs). All five of the products we’re studying have a 0 day PHI and a 4 hour REI. But they all still require personal protective equipment (PPE) when handling and applying them. Read and follow those labels! Tank mixing best practices still apply. The table at the end of this post has details about biological compatibility of these products in tank mixes, as reported by the manufacturers. But just like other pesticides, you need to follow the label instructions for mixing. If you have questions about a specific tank mix partner, confirm compatibility with a company rep. Do a “jar test” if you are mixing two products for the first time and want to know if they are physically compatible. Biopesticides (especially those that contain living microorganisms) often need to be handled and used differently than chemical pesticides. They may be more sensitive to temperature, moisture, or UV light, which may impact the best time or place to apply them. And of course you don’t want to tank mix a living microorganism with something that will kill the good microbe. (Cleaning your tank well between sprays is always recommended, whether or not you are using a biopesticide.) The following table summarizes details for the five products we’re studying provided by the manufacturers – from product labels, company websites, and conversations with company reps. We have not personally tested this information. Exactly how should you use these biofungicides to maximize their efficacy? This table summarizes best practices (as reported by the manufacturers) for each of the five fungicides tested in this trial. Click on the table to enlarge it. 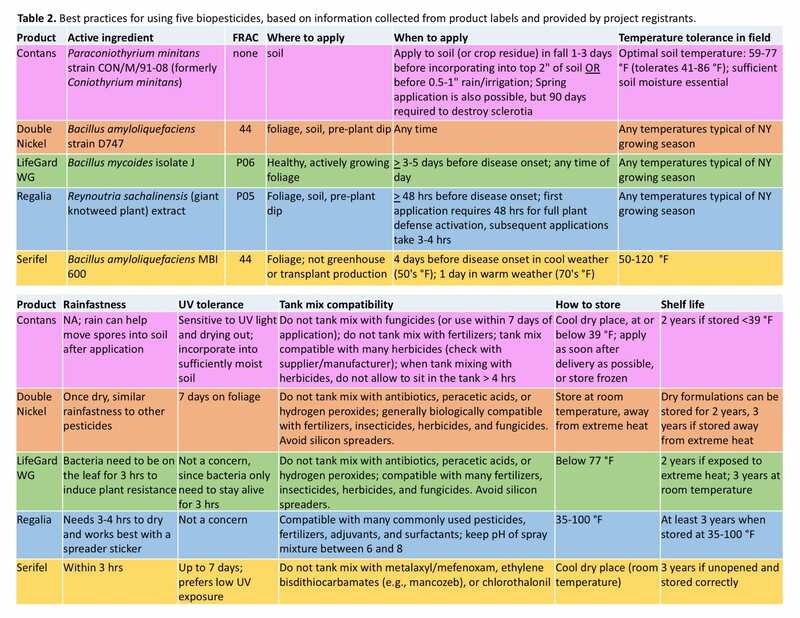 We’ve created handouts that summarize the designs of both the cucurbit powdery mildew and the white mold trials, the modes of action of the five biofungicides we’re testing, and the best practices information presented above. 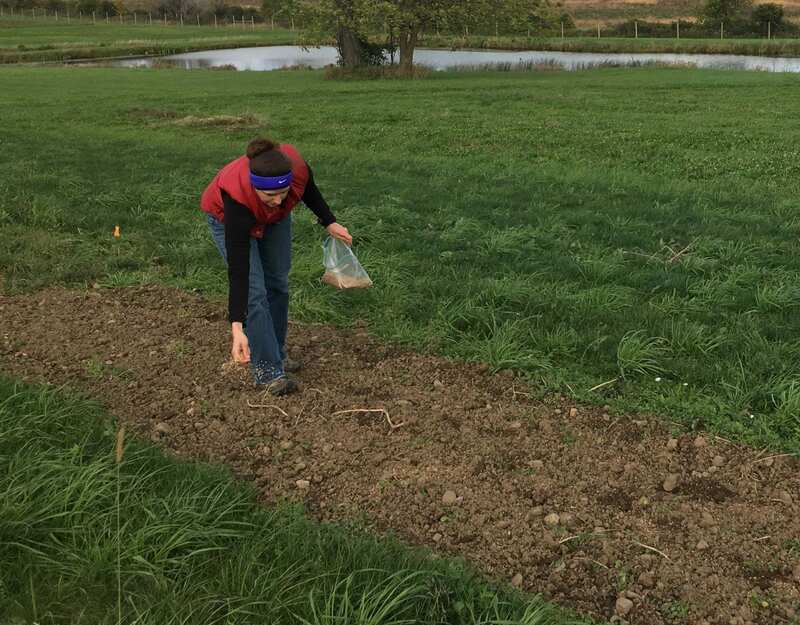 Stay tuned for Part 3 of this post – results from our first year of field trials! 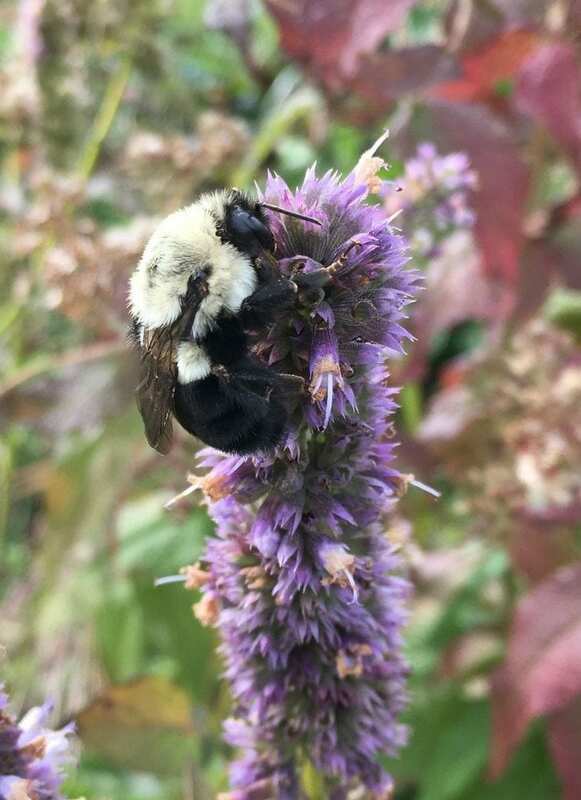 This post was written by Amara Dunn (NYS IPM) and Sarah Pethybridge (Plant Pathology & Plant-Microbe Biology, School of Integrative Plant Science, Cornell University). Thank you to the New York Farm Viability Institute for funding. This summer I have been working with great colleagues (Elizabeth Buck, Dr. Julie Kikkert, Dr. Margaret McGrath, Jud Reid, and Crystal Stewart) on a project funded by the New York Farm Viability Institute looking at the use of biofungicides (Remember what biofungicides are?) in vegetable disease management. 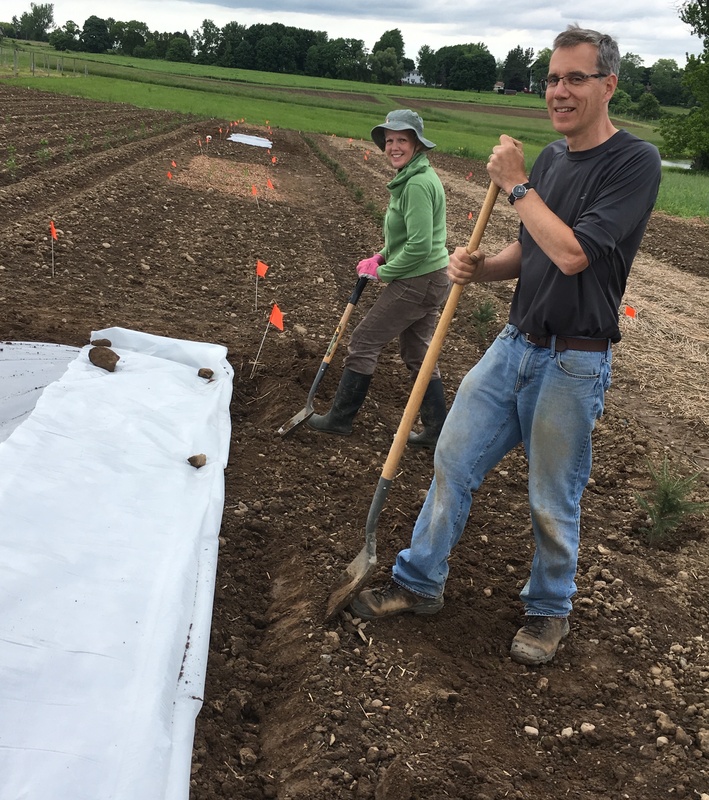 Dr. Darcy Telenko (formerly of the Cornell Vegetable Program) helped plan the project before starting her new position at Purdue University, and Dr. Sarah Pethybridge has provided valuable advice based on her extensive work with white mold (including control with biofungicides). BASF, Bayer, BioWorks, Certis, Dow, and Marrone BioInnovations provided product for the field trials. For both diseases (cucurbit powdery mildew and white mold), we’re considering biofungicides used with other pest management – other biofungicides, conventional chemical fungicides, and/or cultural practices. Biofungicides are not expected to be silver bullets, and they work best when used in an IPM strategy. But when deciding whether or how to use them in your operation, it’s good to know what value you’re getting for the extra costs of purchasing and applying the products. This summer we ran trials in three major vegetable-producing regions of the state: western New York, eastern NY, and on Long Island. 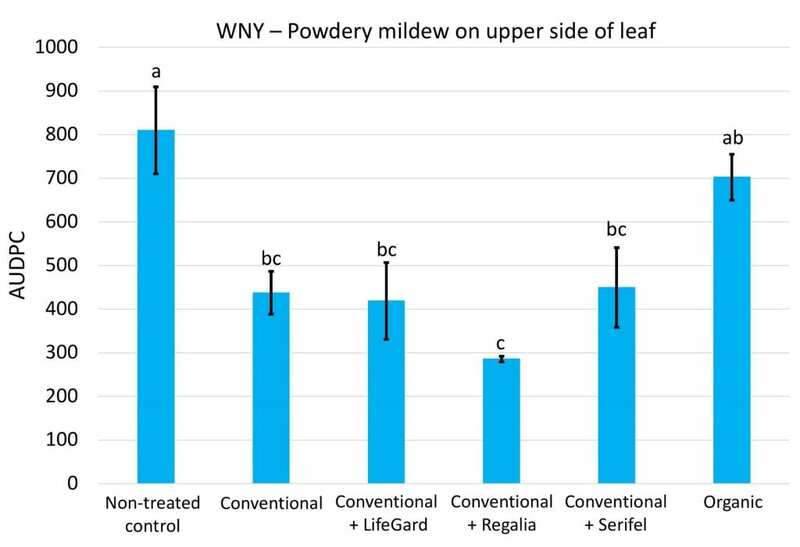 For combatting cucurbit powdery mildew, we’re comparing three biofungicides: LifeGard (Bacillus mycoides isolate J), Regalia (extract from the giant knotweed plant Reynoutria sachalinensis), and Serifel (Bacillus amyloliquefaciens MBI 600). All three were applied weekly starting when the plants were small. 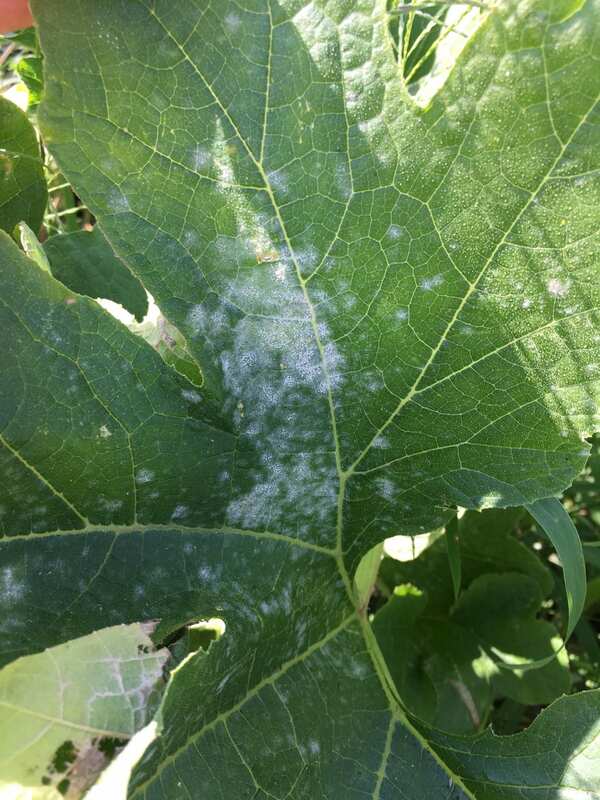 Then, when the first signs of powdery mildew showed up, we started a rotation of conventional fungicides (Vivando, Quintec, and Luna Experience). 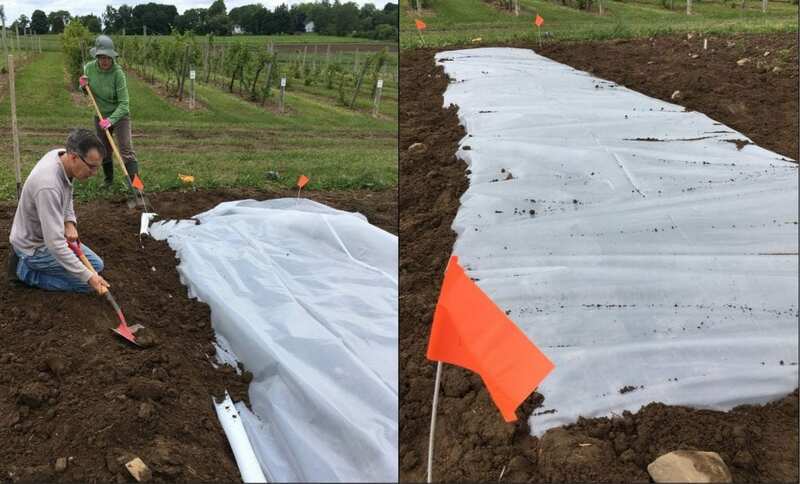 These three treatments plus a rotation of all-organic fungicides (LifeGard, MilStop, Serifel, and a mineral oil) are being compared to two control treatments: the conventional fungicides alone, and plants that received no treatment for powdery mildew. 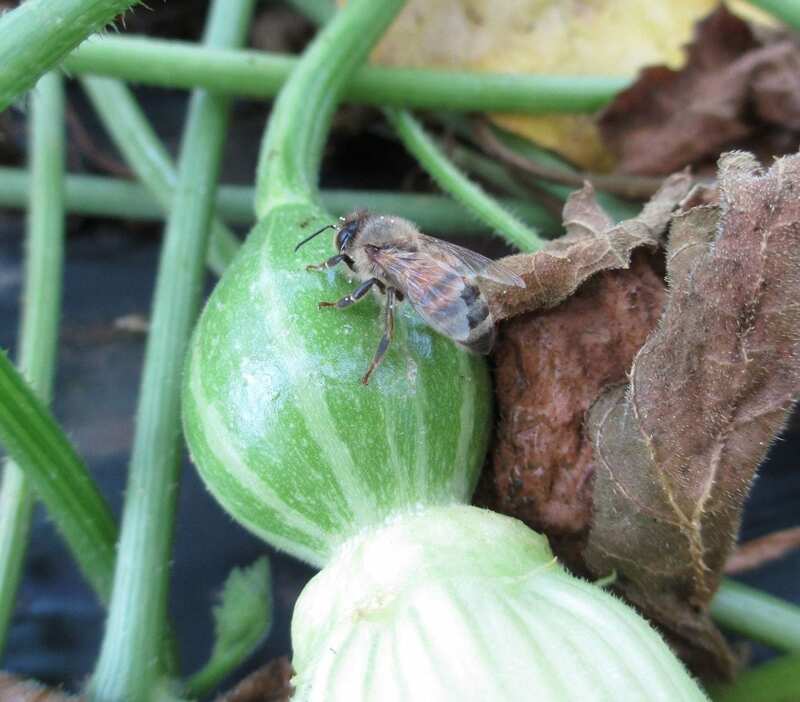 We ran the trials on a variety of bushing acorn squash (‘Honey Bear’) that has intermediate resistance to powdery mildew. In the white mold trial, we’re looking at Double Nickel (Bacillus amyloliquefaciens strain D747) alone or in combination with Contans (Paraconiothyrium minitans strain CON/M/91-08; formerly Coniothyrium minitans). Next year we’ll look at these biofungicides in combination with reduced tillage at one site. Reduced tillage is another IPM strategy for white mold. The active ingredient in Contans is a fungus that eats the resting structures (sclerotia) of the fungus that causes the disease white mold. 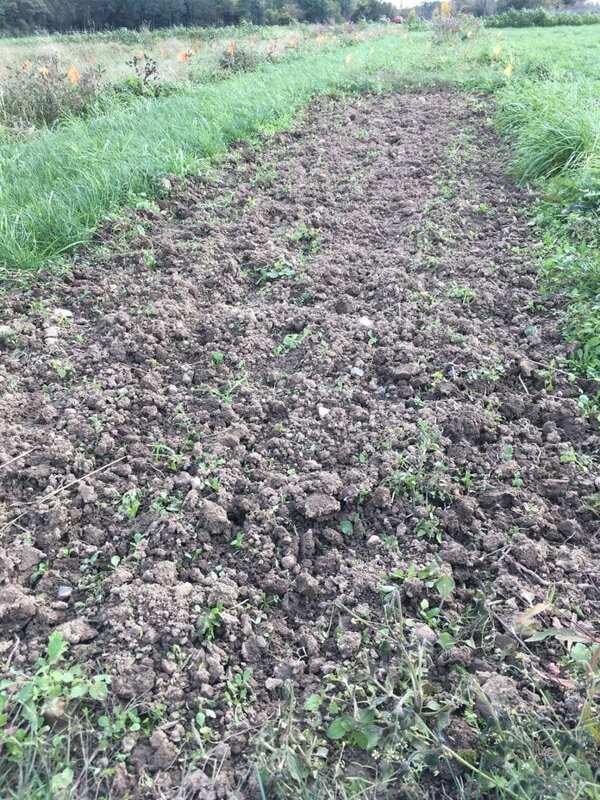 Because of this, it needs time to work, and is applied either in fall or spring. The goal is to reduce the number of sclerotia present in the next crop. Next year we’ll collect data on whether application of Contans reduced disease. 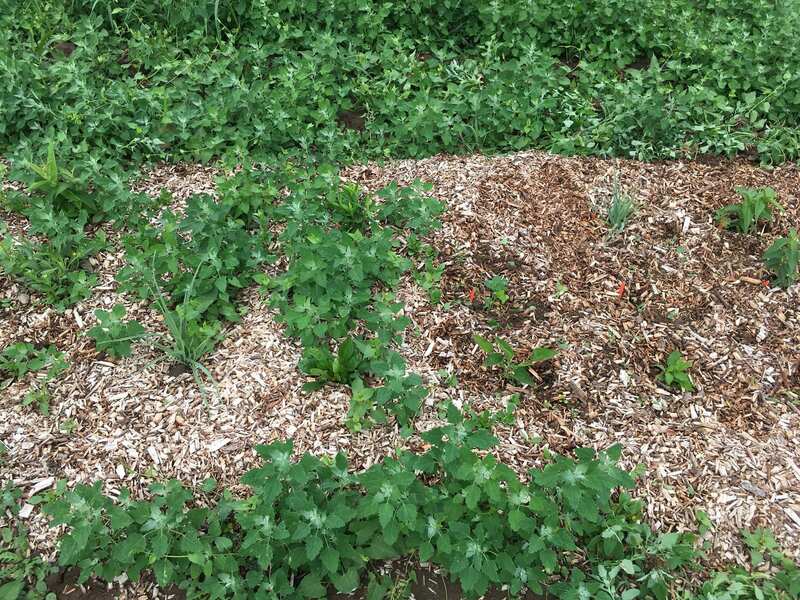 In the meantime, during the 2018 growing season treatments we tested were Double Nickel, Cueva (an OMRI-approved copper) and no treatment for white mold on snap bean. 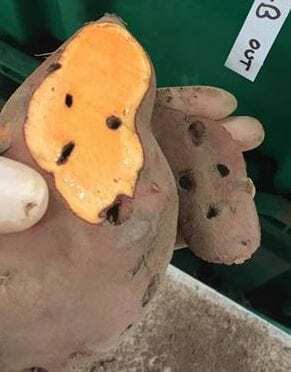 Previous research by the EVADE Lab at Cornell AgriTech at The New York State Agricultural Experiment Station, Geneva, New York, has shown that Double Nickel is a promising biofungicide for white mold. In a nutshell, the “normalized difference vegetation index” (NDVI) is a way to quantify how much healthy, green foliage is present. The device we used emits different types (wavelengths) of light (red and near infrared), and measures how much of each type of light is reflected back from the leaves of the plant. Leaves that are dark green and healthy reflect more infrared light and absorb a lot of red light. 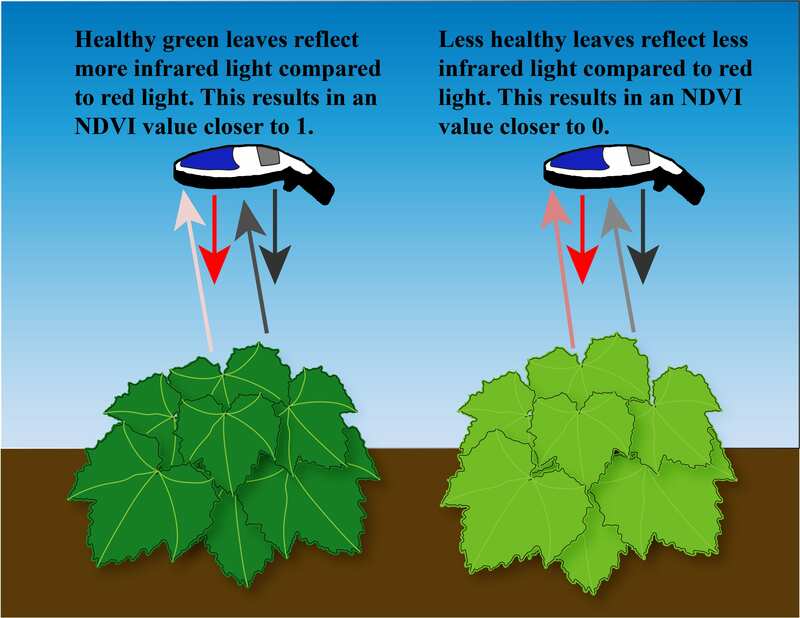 Less healthy leaves reflect less infrared light. A NDVI value closer to 1 indicates healthier plants. A NDVI value closer to 0 indicates less healthy plants (or more bare ground). Help us quantify the health of plants. Even though NDVI is not a measure of disease, we would expect to see more healthy foliage if biofungicides are contributing to disease control. 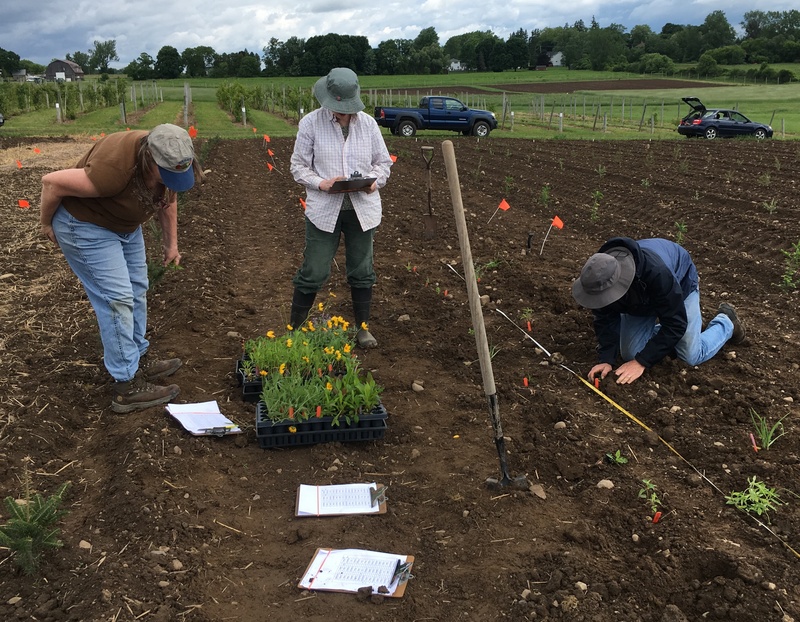 Provide some preliminary data to help us determine whether NDVI measurements could be useful to NY fresh vegetable growers. Field meetings were held at each powdery mildew trial location so that local growers could see the trials and hear about the project. We’re currently wrapping up data analysis from the 2018 field season. You’ll be able to learn about results from the first year of this two-year project at winter meetings around NY, in extension newsletters, and here on this blog. Also, stay tuned for Part 2 of this post with details about how these biofungicides work (modes of action), and how to use them most effectively. 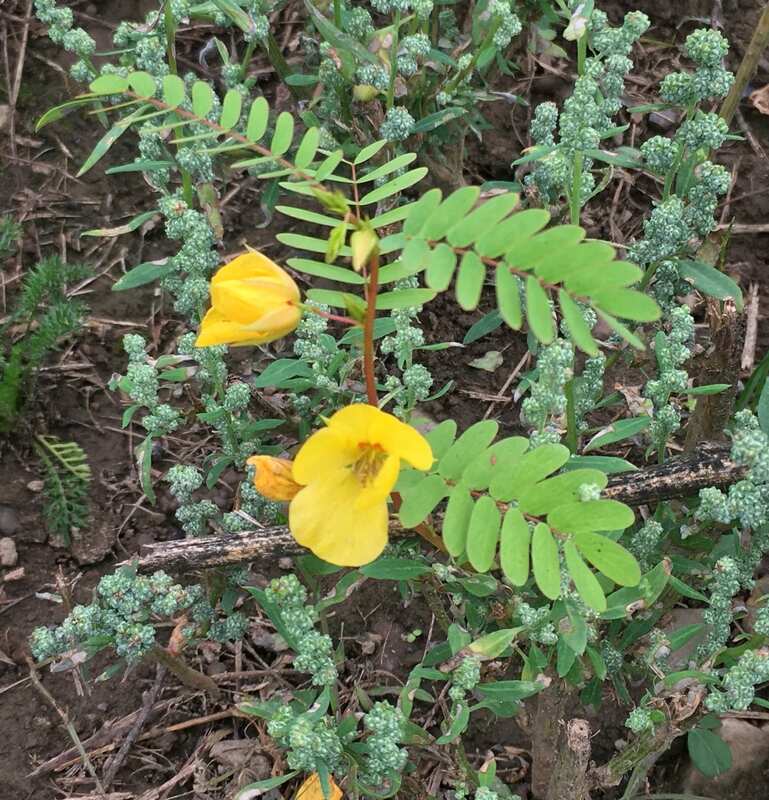 This post was written by Amara Dunn (NYS IPM), Sarah Pethybridge (Plant Pathology & Plant-Microbe Biology, School of Integrative Plant Science, Cornell University), and Darcy Telenko (Department of Botany & Plant Pathology, Purdue University). Could your lawn use some biocontrol? Scout first. These white grubs can damage your lawn…but only if enough of them are present. Don’t waste time and money treating for them if you don’t need to! For much of this summer, many people in NY had “water” at the top of their lawn care list. White grubs are another concern for home lawns. 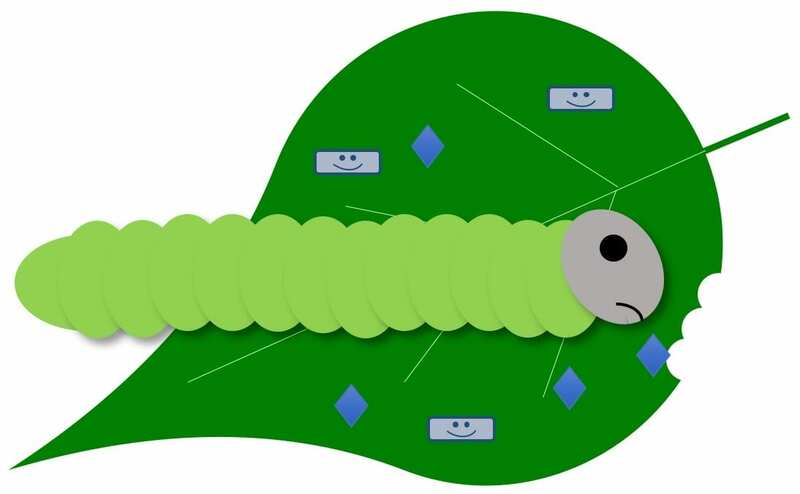 But finding a grub in your lawn does not automatically mean that you need to treat. Before you think about doing anything to your lawn to kill grubs, you should know how many grubs you have, and which species they are. If you do need to treat, consider using biocontrol. Good news! It’s the perfect time of year to scout for white grubs. Starting in mid to late August, and continuing into October, grubs that hatched from eggs laid during the summer will be just beneath the surface of your lawn, feeding on the roots of your grass plants. This is the time to look for grubs. You might also notice some damage to your lawn from white grub feeding during this window. 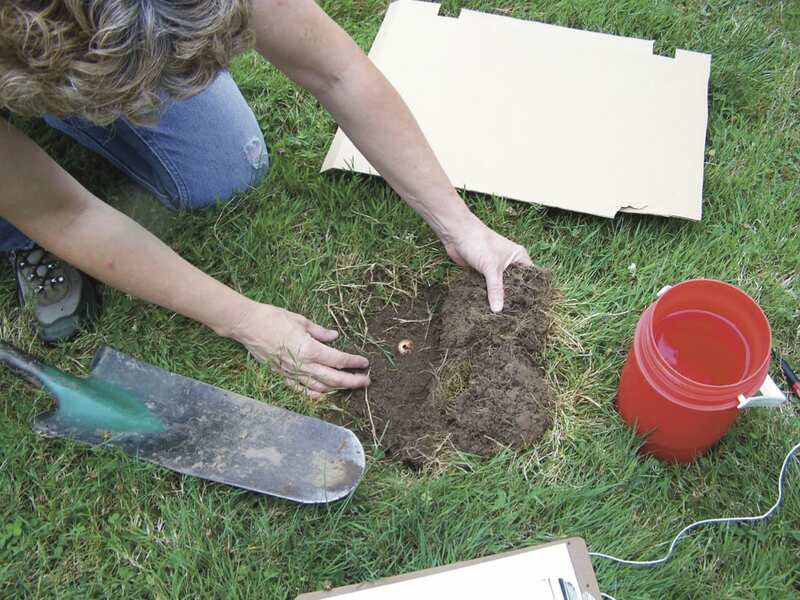 Late August through October is the perfect time of year to look for grubs in your lawn. The grubs will be young and close to the surface. X marks the spot (to sample for grubs)! 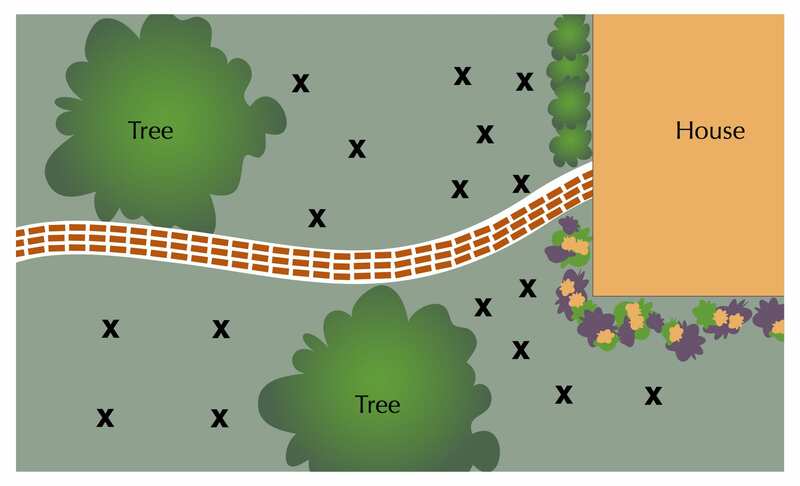 Select parts of your lawn where you think there might be grubs, sample in these places, and take notes on what you find. Take a look at this fact sheet for detailed instructions on sampling your lawn. All you need is a piece of paper, something to write with, and a shovel or trowel. Check 1 foot by 1 foot squares around the lawn. If you have a bulb planter with a diameter of approximately 4.25 inches, or a golf course cup cutter, this works, too. Make notes about where you’ve sampled and how many grubs you found in each spot. 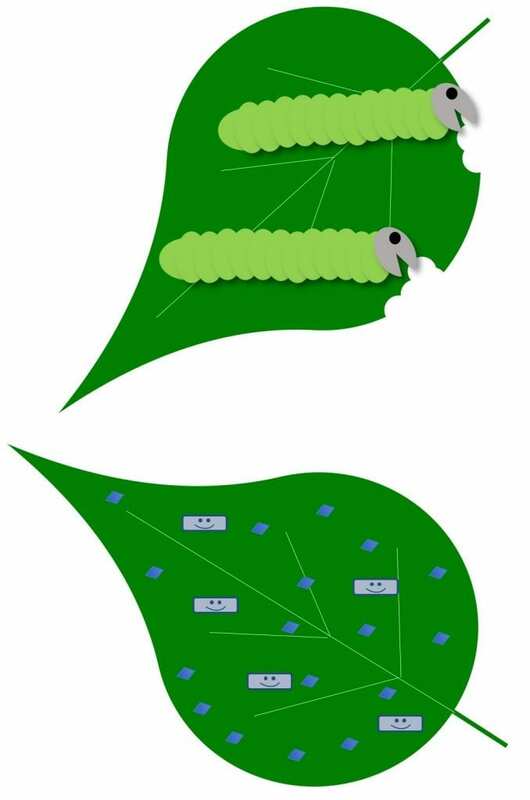 Save the grubs from each sampling location separately. 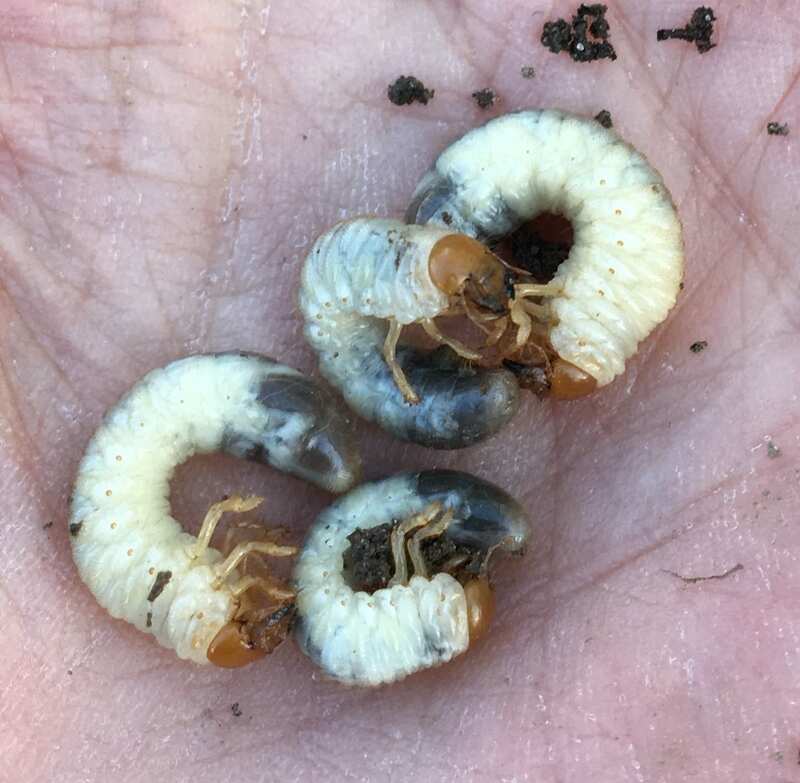 White grubs may look very similar, but they are not! Different species cause different amounts of damage to your lawn. If you find more than the number of grubs per square foot (or per 4.25-inch diameter soil core), you might consider treating your lawn for grubs. If not, you don’t need to do anything! 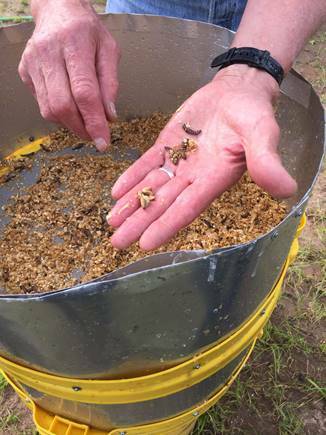 Fortunately, identifying grubs is easy, too! All you need is a penny, a hand lens with at least 15x magnification, and this online Grub ID tool. 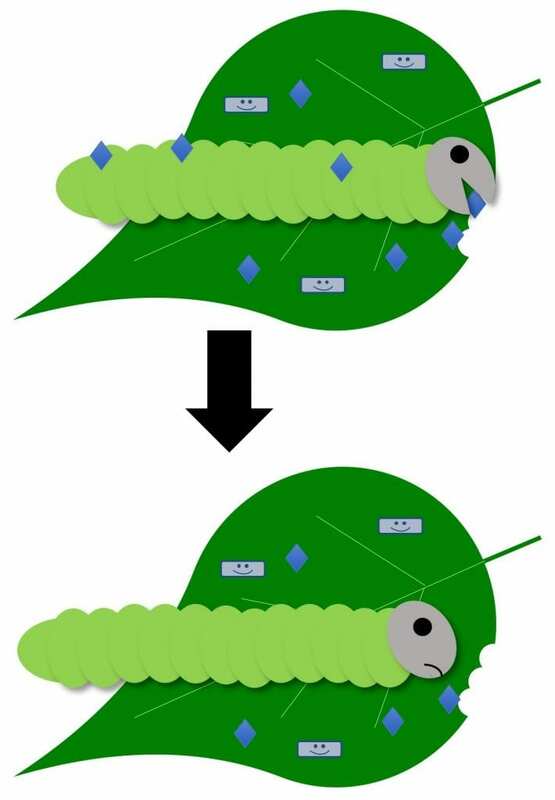 First, use the green “Learn how to identify grubs” button to find out which part of the grub to look at and how to hold it. Next, follow the instructions to compare each grub you found to the size of a penny. 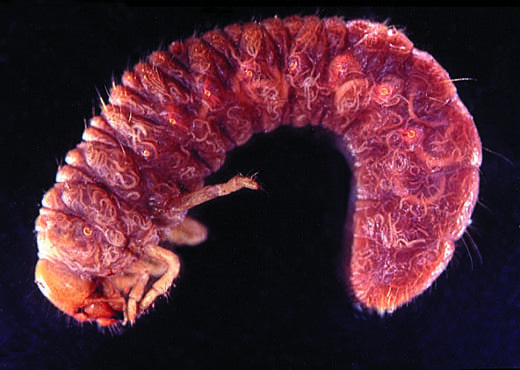 The Grub ID tool explains exactly which part of the white grub to look at when you are identifying it. Just click the green button. 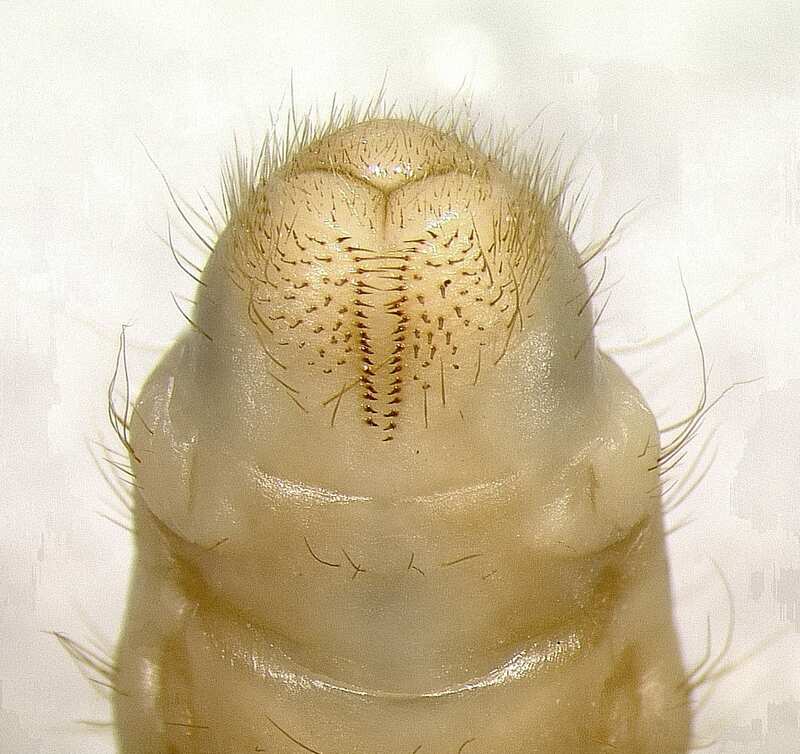 Take a close look at the rear end of a white grub (using a 15x hand lens) to find out which species you have. Finally, inspect its rear end with a hand lens to determine which species you have. Once you’ve identified the species, click on the species name to find specific management information. Now, look at that table again. 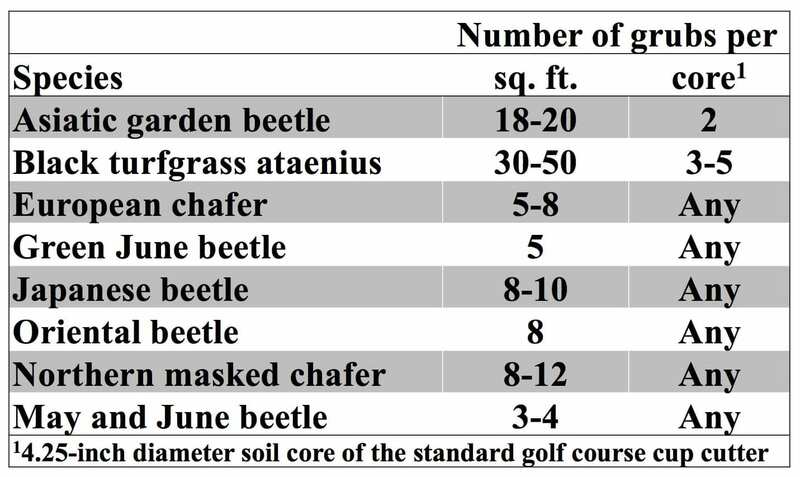 For the species you found in your yard, do you have more than the listed number per square foot (or per 4.25-inch diameter soil core)? If not, then don’t waste time or money treating your lawn. Most likely, only a few spots in your lawn (if any) warrant grub treatment. This is why you took careful notes about where you found grubs. Late August through September is also a good time to use a curative treatment for grubs in NY. The grubs are small and easier to kill. Some chemicals are effective when used at this time (but not the ones that are taken up by the plant!). 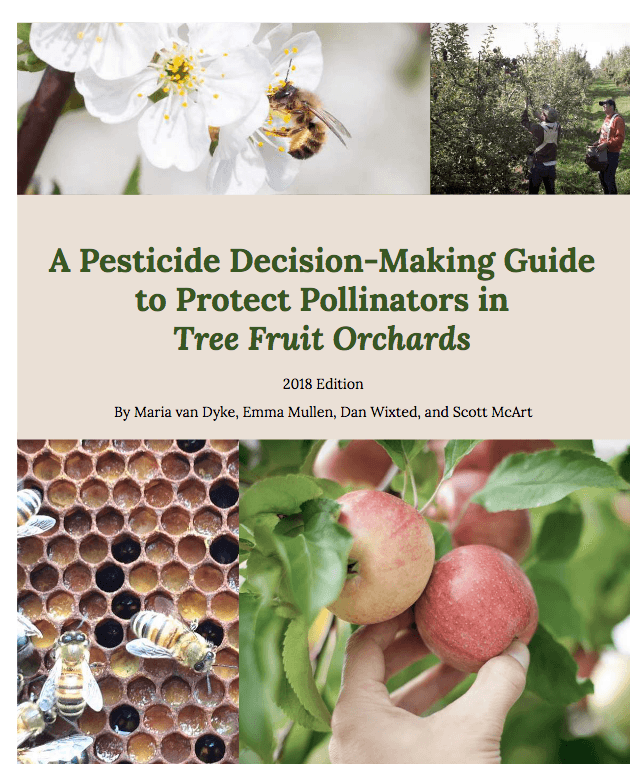 A preventative pesticide that is taken up by the plant and kills the next generation of grubs when they start feeding in the late summer and fall should be applied in May or June. Before using any pesticide, find out if it is allowed in NY and find the product label using the New York State Pesticide Administration Database (NYSPAD). If a product isn’t listed in this database, you may not use it in NYS (even if you can buy it online). You must follow all instructions on the label. Use the product registration section of the New York State’s Pesticide Administration Database (NYSPAD) to check if a white grub pesticide is allowed in NY. When you get to the website, follow the three simple steps shown here. Unlike the healthy white grubs you saw earlier in this post, this grub has been killed by nematodes. But why use a chemical when you could use a biological control? Entomopathogenic nematodes are tiny beneficial worms that don’t harm plants, but kill grubs. See how they do it by watching this short video. Why wouldn’t you want these nematodes working for you? Beneficial nematodes are a curative white grub treatment, so they should be applied between mid to late August and October. 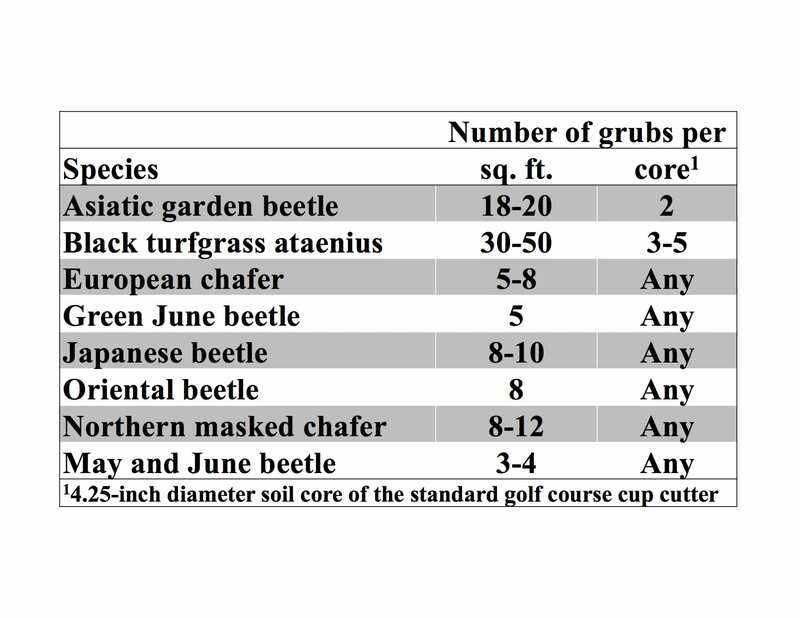 But you still only need to apply them to spots where grub numbers exceeded the thresholds in this table. You can purchase nematodes from garden centers or online garden supply stores. Look for the nematode species Heterorhabditis bacteriophora and Steinernema feltiae. Grub-killing nematodes are sold as what looks like a dry powder. Dissolve them in non-chlorinated water (if available) before applying them to your lawn. Follow all package instructions. For both species, make sure to follow the instructions on the package for storing and applying them. Nematodes will be harmed by ultraviolet light, so apply them around dawn or dusk, and water them afterwards to wash them into the root zone of the grass (where the grubs are). Any type of sprayer (as long as it doesn’t contain a fine mesh) or even a watering can will work to apply nematodes. If you use a sprayer, keep the pressure below 30 pounds per square inch. When you’re mixing up the nematodes, if non-chlorinated water is available, use that. Chlorinated water is fine for watering them in after you apply them. Regardless of what treatment you use, scout your lawn again next year to find out how well your IPM strategy worked, and if there are other areas you need to treat (or not). 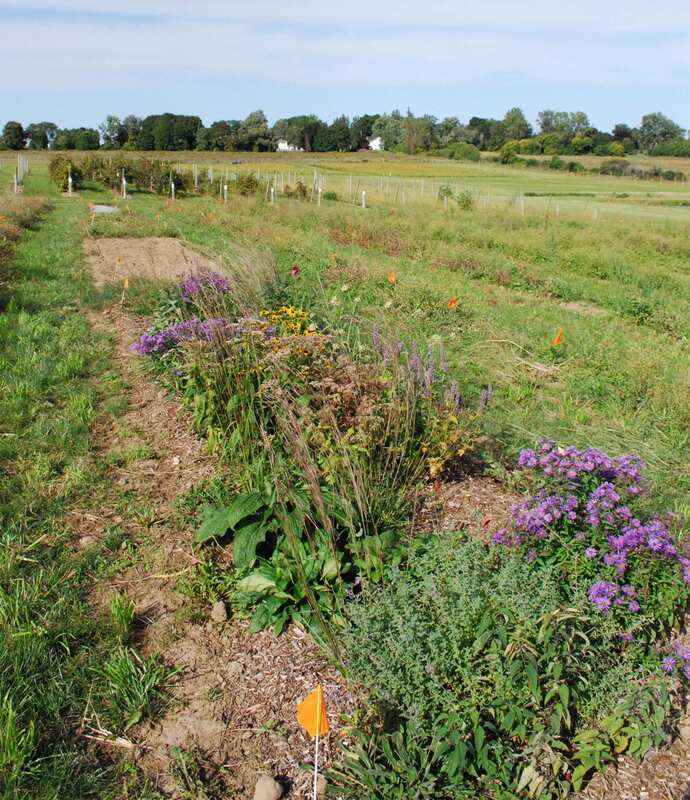 This post was written by Amara Dunn (NYS IPM) and Kyle Wickings (Department of Entomology, Cornell University). Managing mosquitoes around your home…there’s a biocontrol for that! Are mosquitoes bothering you while you enjoy summer in your backyard? 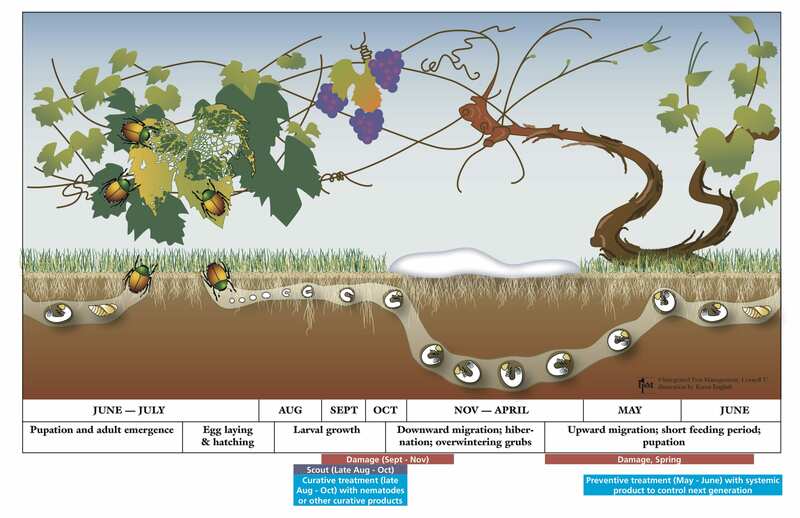 An IPM approach is definitely the way to go. Start by checking your yard to see where water might be standing. It could be in toys, flower pots, tarps, wheel barrows, gutters, bottle caps, or so many other places you may not have noticed. Removing standing water from your yard takes away places where mosquitoes breed. Less mosquito breeding, fewer mosquitoes. Always think prevention first when you’re addressing a mosquito problem. Read more about mosquito IPM on the Think IPM Blog and What’s Bugging You? 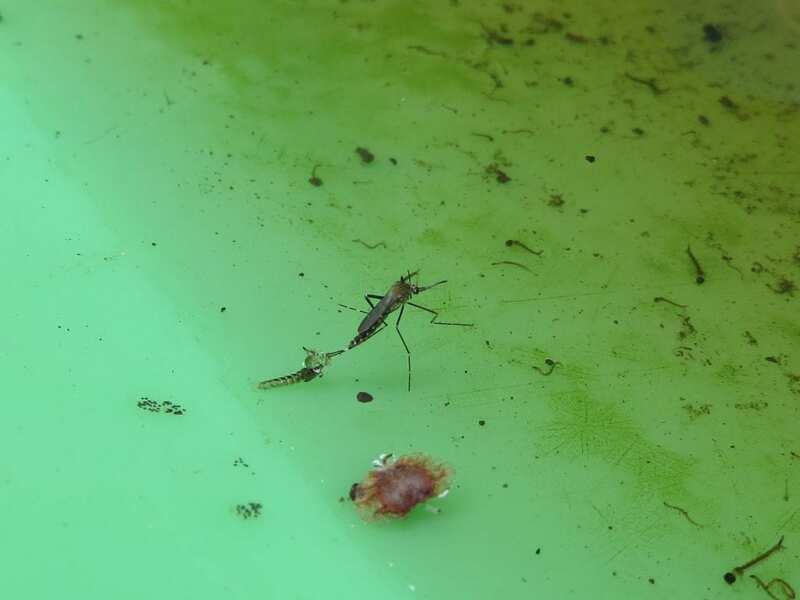 If there are still some containers you just can’t empty (for example, a lined garden pond), you can find some biopesticides (remember, some biopesticides are biocontrols, too!) in your local garden center to help you with your mosquito IPM. Just make sure you follow all instructions on the label of any product you buy. Read all about mosquito biocontrol on this new fact sheet. And, if you want to learn so much more about IPM for both mosquitoes and ticks, you still have a little time to register for the 4th Annual NYS IPM Conference on Integrated Management of Ticks and Mosquitoes. But hurry – the conference is August 7th!